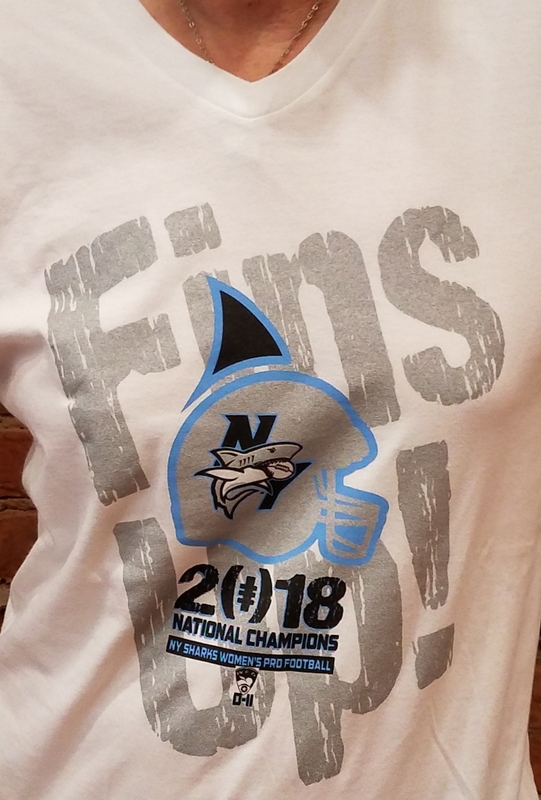 Get your commemorative NY Sharks Championship Tee Shirt, available in 2 style options: V-Neck or Crew Neck. Quantities and sizes are limited!! An idea conceived of while in the United Kingdom, our thanks to Mr. Pat Brown for View cartpulling this list together!! Fins UP Always!! The weather was perfect and the company was even better!! The WFA D2 and Transatlantic Trophy Champion Sharks were reunited this past weekend for the Grand FINale Shark Banquet. 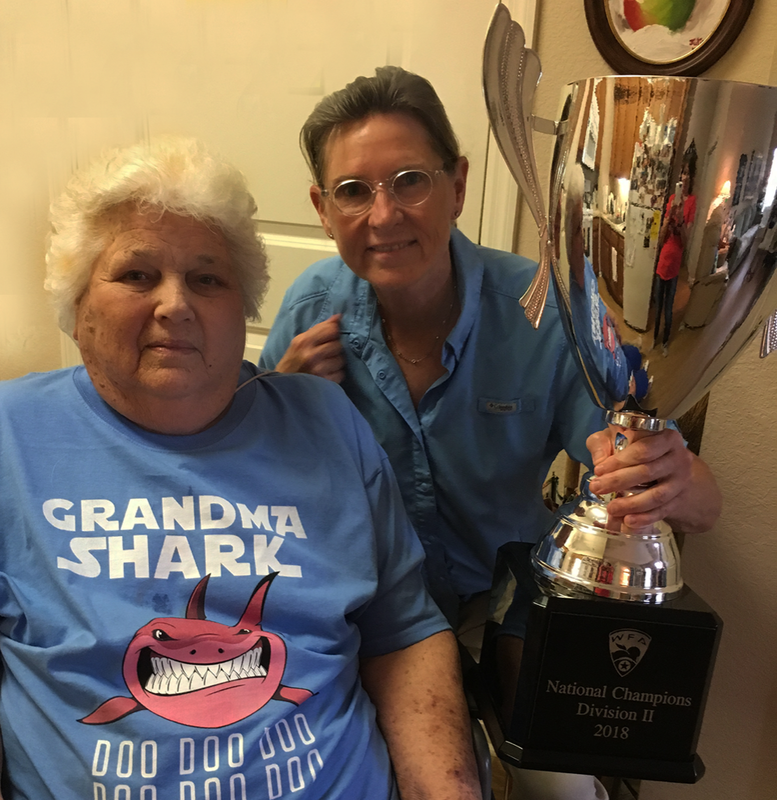 We laughed out loud all over again as Owner, Andra Douglas, read the traditional “Shirt” that each of us received as a FINtastic memory of this past season. 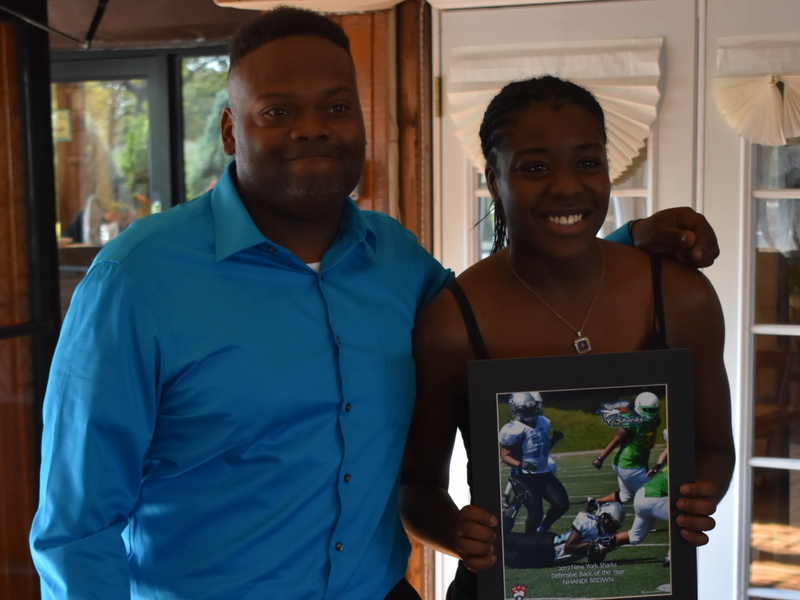 Awards were bestowed on many deserving recipients and the celebration of an amazing season continued. 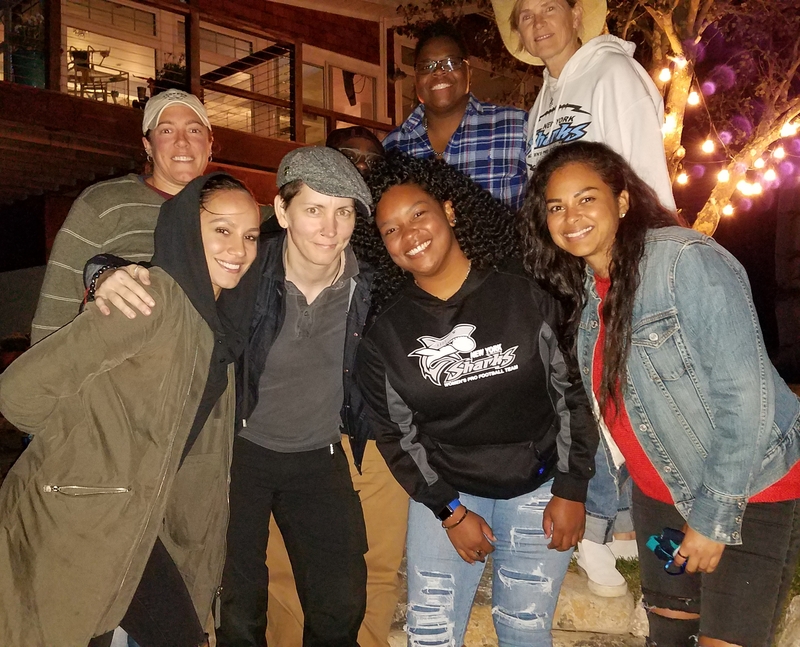 This year was a very personal one for most of us, especially Shark’s Owner, Andra Douglas, who hosted the event for all the Mighty Finned Ones. Thank you, Great White!! 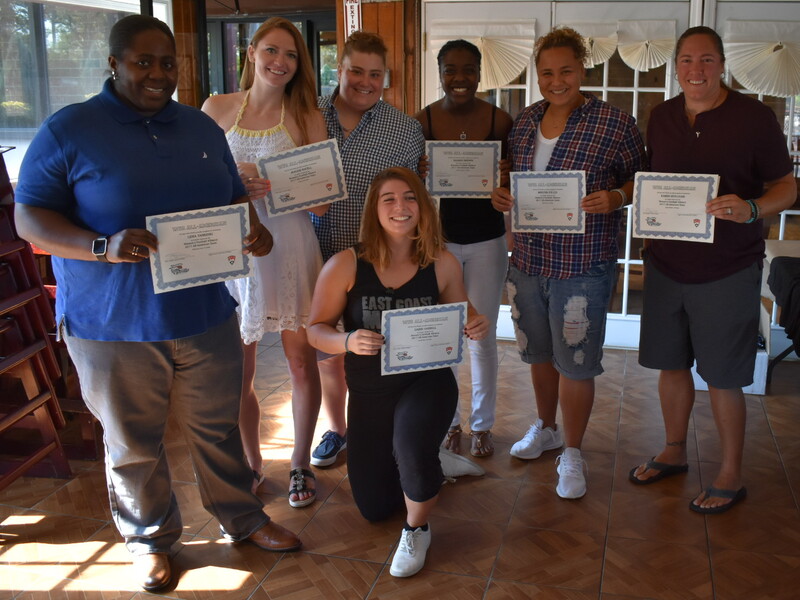 Congratulations to all of the award recipients and to us ALL, on a storybook season and ending for the Mighty New York Sharks! Shark staff with their beautiful gifts from the players – a football with the team photo. 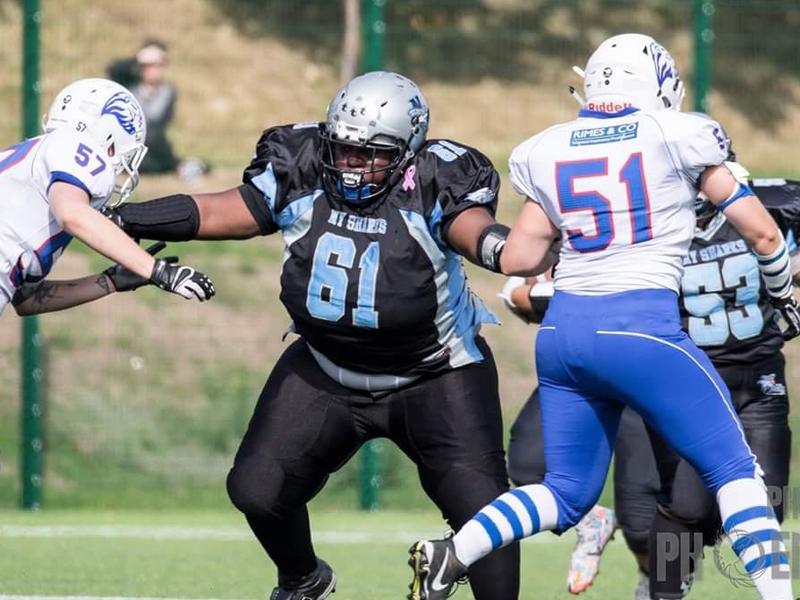 Your New York Sharks defeated both the Helsinki Wolverines from Finland (27-14) and the Birmingham Lions from England (47-9) to win this inaugural event held at the University of Birmingham, England. 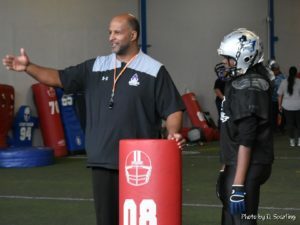 The Sharks are the first U.S. based market team (to our knowledge) to travel outside of the North American continent to play 11 on 11 tackle football against teams from Europe. This was truly a trip of a lifetime for us all. 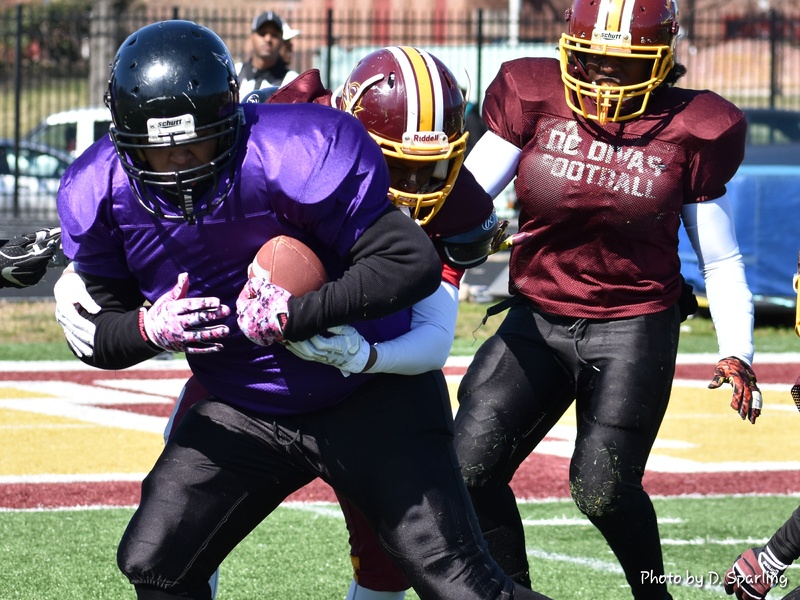 Our hosts, the Birmingham Lions, produced an amazing, well – coordinated event. We thank them for inviting us and for doing such a brilliant job on all fronts!! 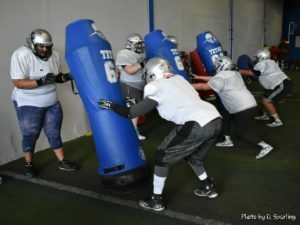 The New York Sharks will play in their final two games as an organization at the end of this month in Birmingham, England. 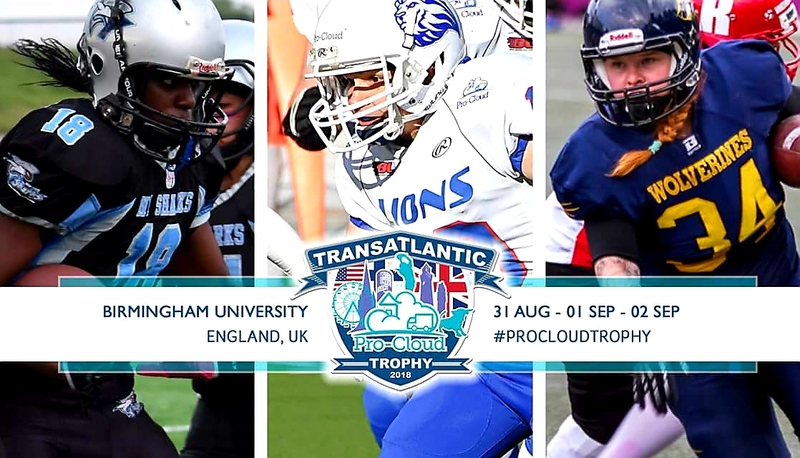 This first ever event, produced by the Birmingham Lions Women’s Tackle Football Team, will bring three championship teams from two continents together to play in a round robin tournament. 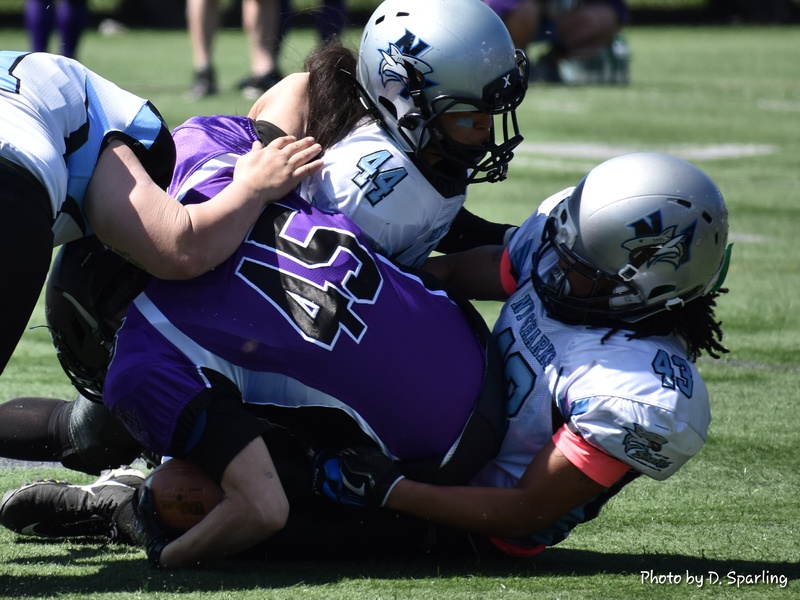 The Helsinki (Finland) Wolverines will join the Sharks and the Lions for this exciting first of it’s kind women’s football competition!! Check back here for more details on game times, Shark Fans!! All Fins are UP and headed to England!! The “Signs” seemed to be everywhere leading up to this championship matchup for the ages on a summer “hotlanta” evening at Fifth Third Bank Stadium. 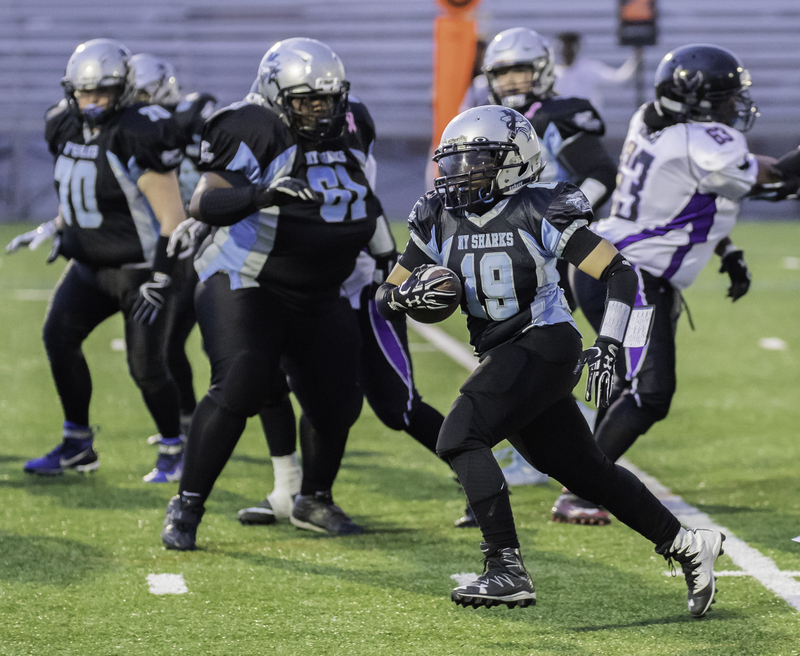 The Shark’s Grand FINale exit from women’s football ended against the opponent with whom it all began some nineteen years ago: The Minnesota Vixen. As the longest lunar eclipse in over one hundred years carried on in the sky – not visible on the U.S. eastern seaboard – the battle on the field carried on for a full four quarters. 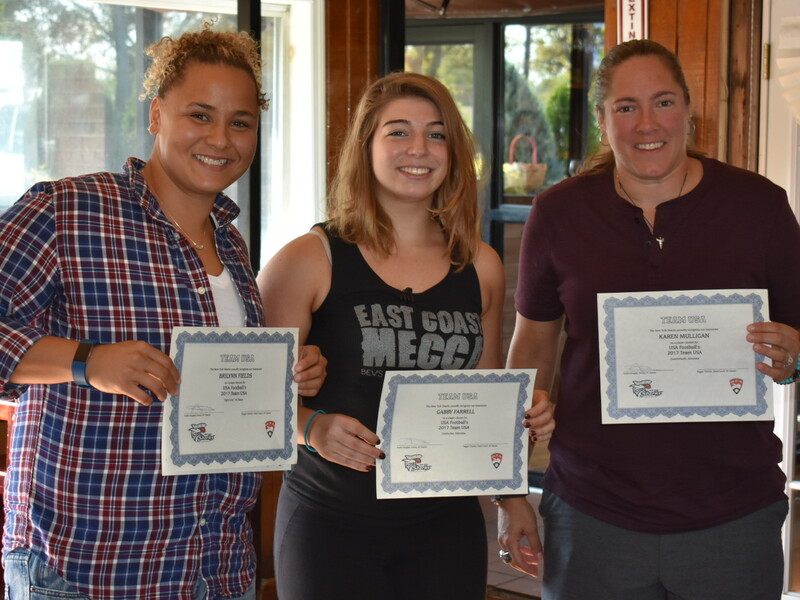 Standout performances were on display by all the Shark players, including two amazing receptions by Gina Capardi; a stellar overall defensive performance – led by Krystal Molina, Kim Rose and Darleen “Blue” Hall; and two critical field goals by Maggie Natell. 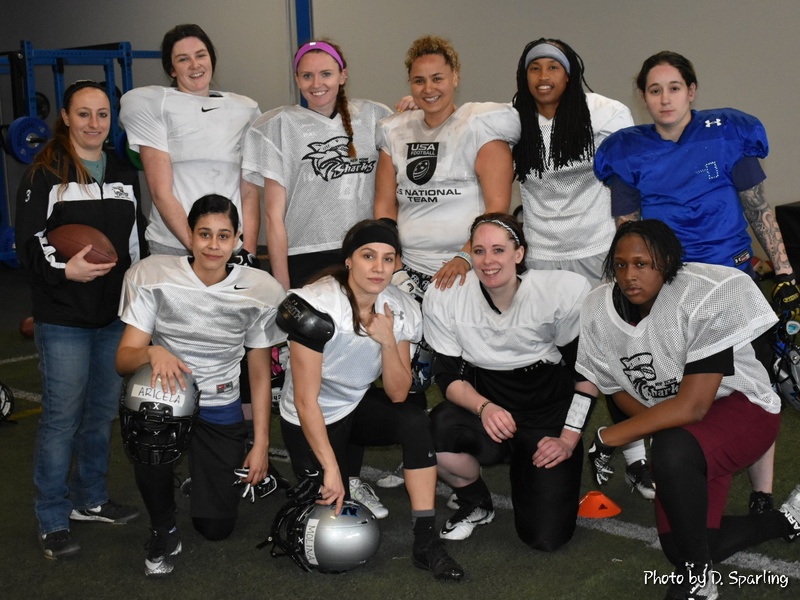 United both on and off the field, the Finned Ones emerged victorious on the heals of a quarterback sneak by Karen Mulligan, on 3rd down and inches, to seal the victory – and the Storybook Ending for our organization. 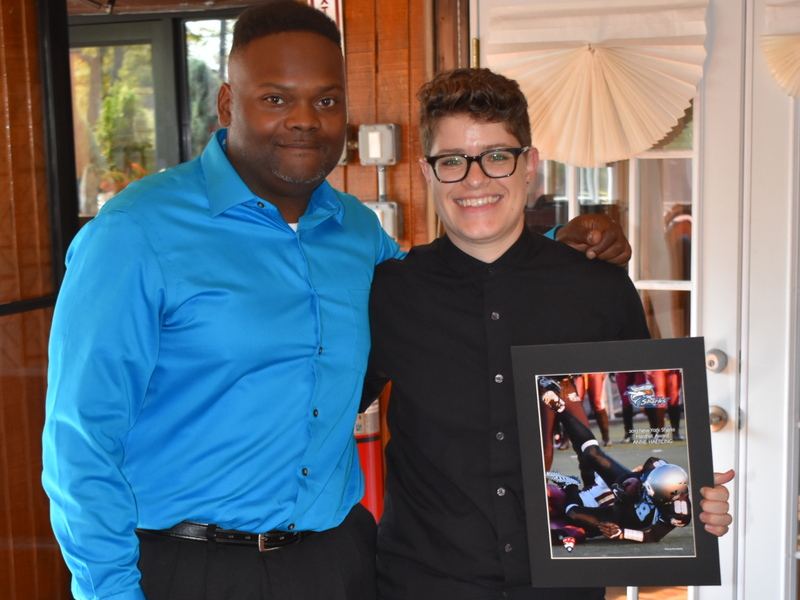 Owner Andra Douglas went out on her own terms and we are all – staff, players, coaches, and fans – better off for it. This family created memories that will last a lifetime and a Championship Title that came from a collective, singularly focused effort on the part of everyone in the organization. We are indebted and grateful to our families for supporting us – day in and day out – for the past seven months. We are grateful to our amazing, loyal fans for nearly twenty years of support. We are proud to have been a “second family” and a “home” for hundreds of women who have proudly donned a New York Shark’s jersey. 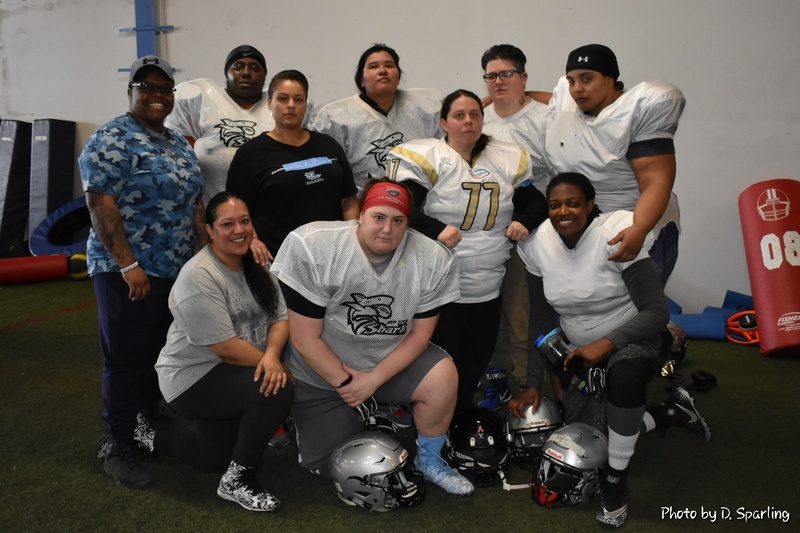 Finally, we wish the women’s tackle team that will take over in the NYC area – the New York Wolves – all the best and many years of success to come! Next Up for the Finned Ones – Heading to the UK to top off the Grand FINale season ithe Inaugural Transatlantic Trophy Tournament!! The event will take place from August 31 – September 1st, 2018 at Birmingham University in Manchester, England. 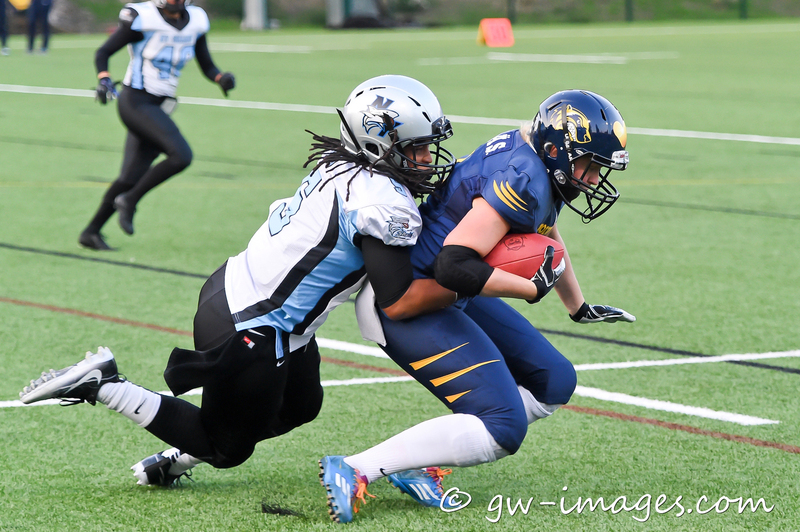 The European teams in the tournament include the Birmingham Lions and the Helsinki Wolverines. 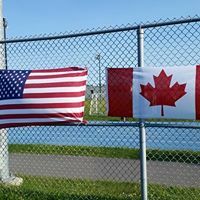 We are thrilled for this invitation, the opportunity to make new football friends and to play two championship title teams from across the pond!! 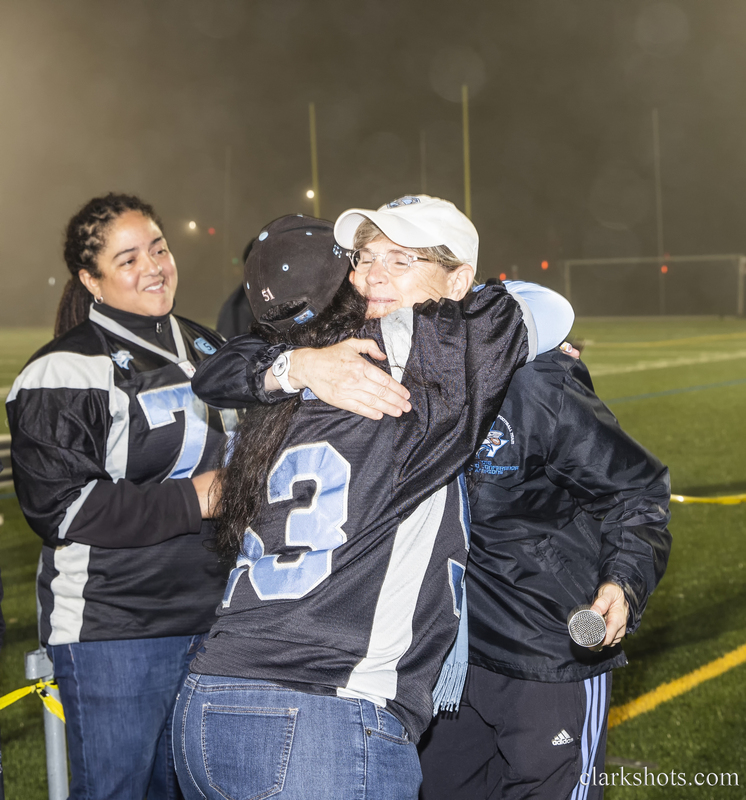 On a night that saw longtime QB Karen Mulligan connect with five different receivers that translated to points on the scoreboard, the Shark Faithful present for the very last home game for the NY Sharks were treated to a contest worthy of being called a Conference Championship. 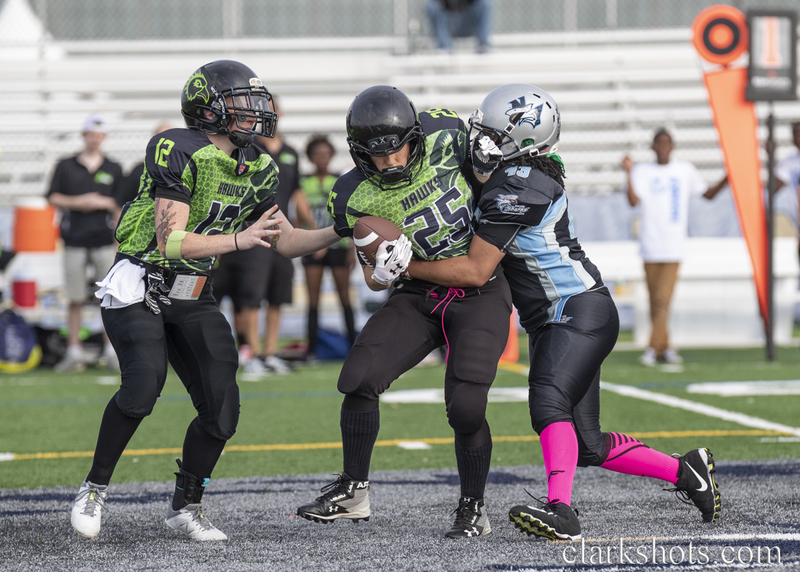 Standout Rookie running back, #20 Janelle Nelson, had two rushing TD’s. The Sharks offensive line was stellar and the defense played was, well, literally everywhere. 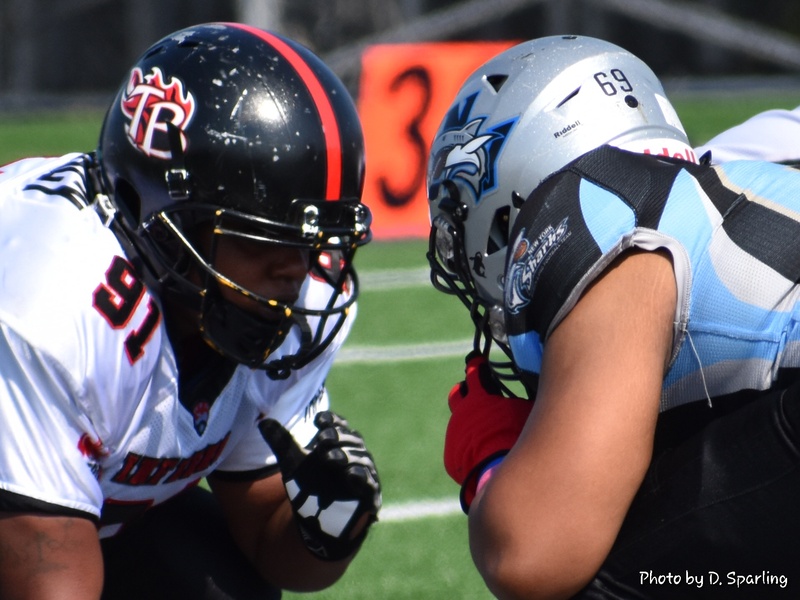 The Tampa Bay Inferno added their own points to the board but in the end, the Finned Ones emerged with a sound and unmistakable victory – earning a berth in the WFA Division 2 National Championship game. 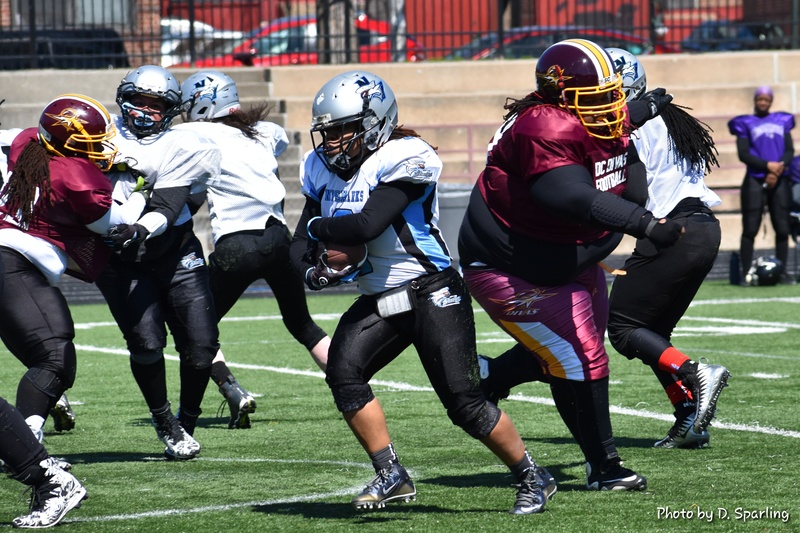 Their opponent will be familiar: the Minnesota Vixen. 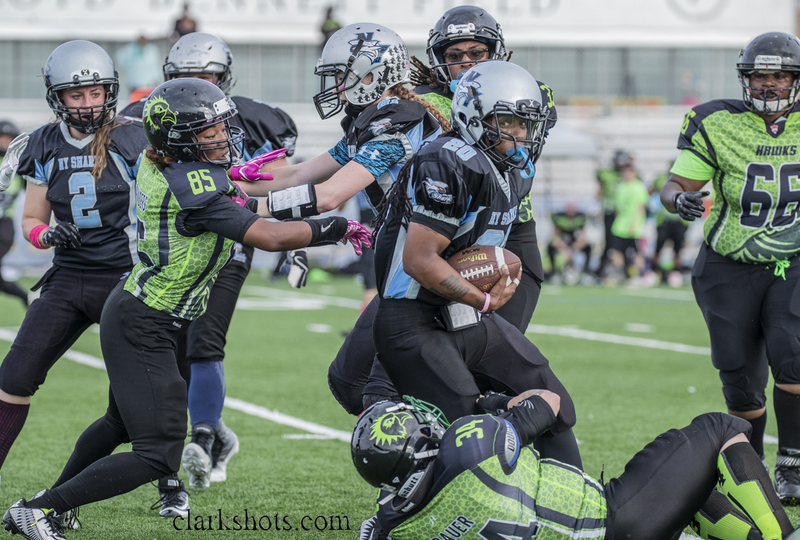 The Sharks last played the Vixen in Minnesota in 2016, where the Vixen defeated the Sharks in the final seconds of the game. 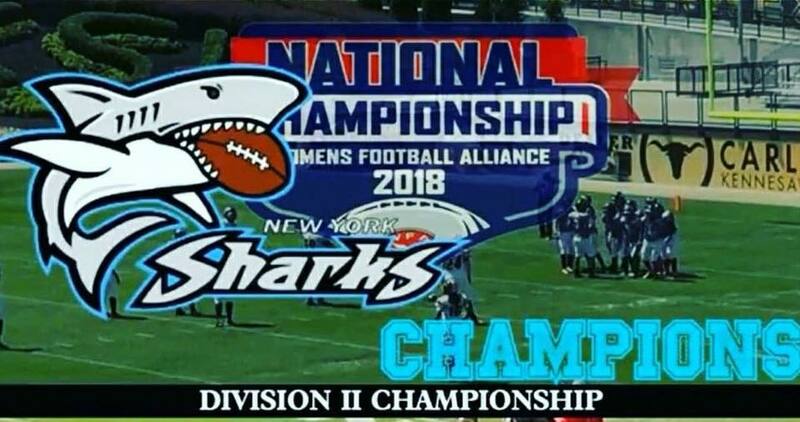 The Sharks are ready for a rematch on the Big Stage that will be 2018 WFA Championship Weekend!! Stay tuned here and on our official Facebook page for updates and information about this much anticipated event!!! 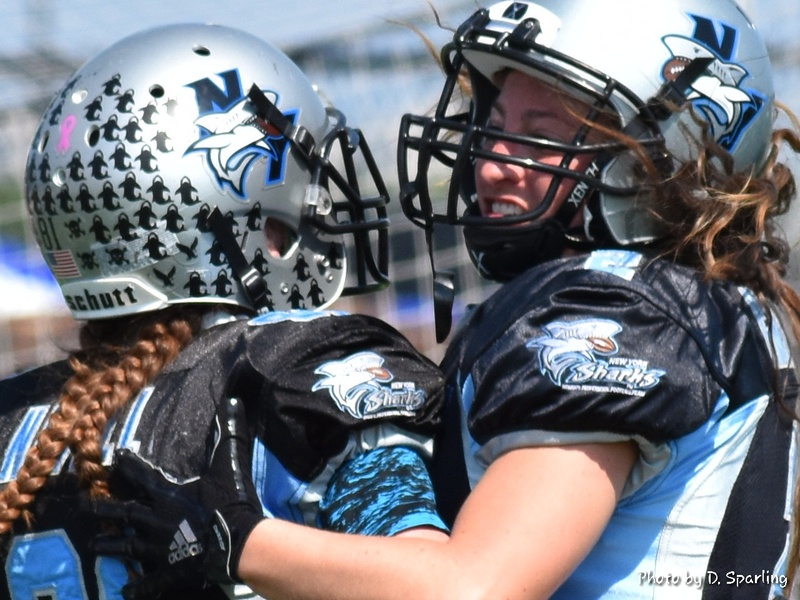 Receivers #81 Maggie Natell and #2 Gina Capardi celebrate after a score! WE DID IT!!! With amazing unity and focus, our Finned Ones put on a tremendous show for the awesome fans who turned out to support us in this 2nd round playoff game. Standout performances were had by players across the board in a thrilling game on a very warm evening at Aviator Sports and Events Center. Touchdowns, multiple turnovers, outstanding work by our offensive line and amazing play by the Sharks defense: It was a Very Good Night. ALL FINS UP, UP, UP!!! In a game where so many played some of their best football to date, this decision was made that much more difficult. Outstanding work, Nikki. Congratulations!!! Congratulations to our Finned Ones!! As mini-camps have started up around the NFL this week, some exciting personnel additions have also been announced. 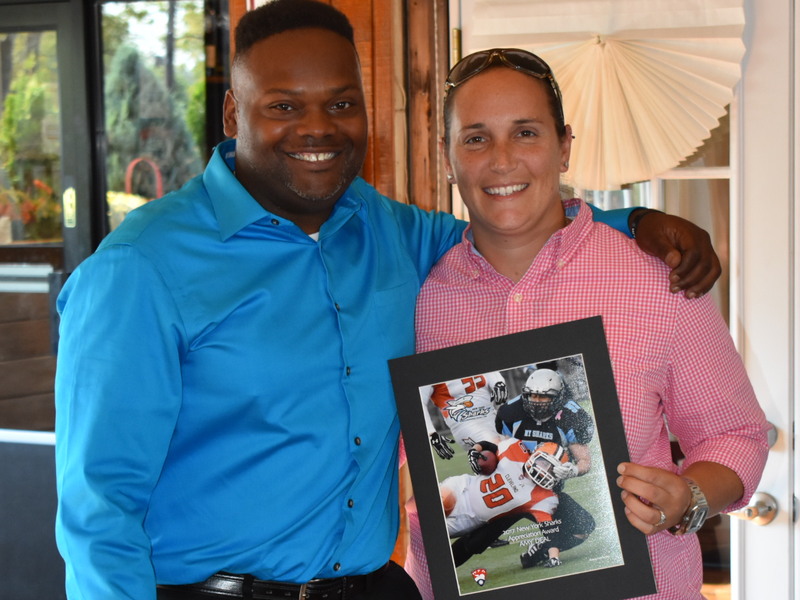 We are very happy to share that Shark’s Receiver, #5 Jennifer King, has joined the staff of the Carolina Panthers as a receivers coach. We wish her all the success that her Fin can Hold!! Congratulations, Jenn – we are proud of you!! Full interview link below. Our Mighty Sharks have earned a 1st round bye and home field advantage for the playoffs!! The players have also earned a welcome break to heal up from the long regular season. 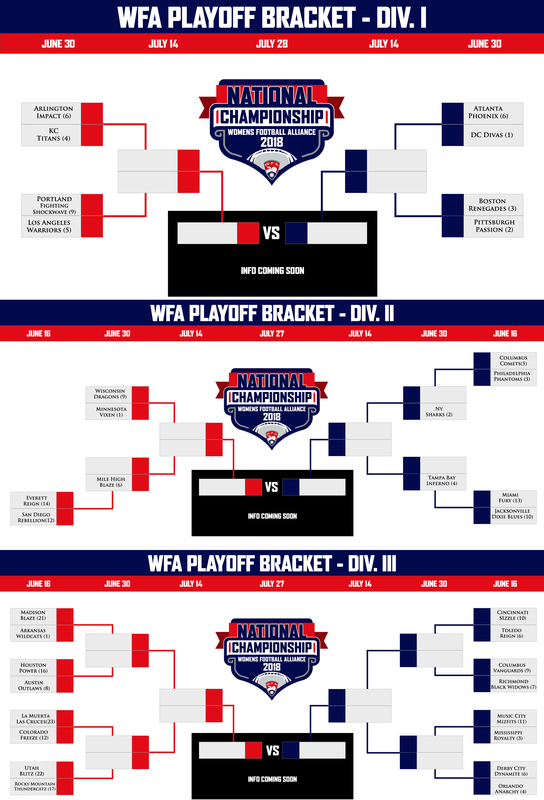 We will be preparing for our first opponent in the 2nd round of playoffs which will be the winner of a game being played this weekend between the Philadelphia Phantomz and the Columbus Comets – in Philadelphia. Your Division Two York Sharks finished the regular season with a loss to the Division One DC Divas 55-6, on a rainy, hot evening in Landover, Maryland. 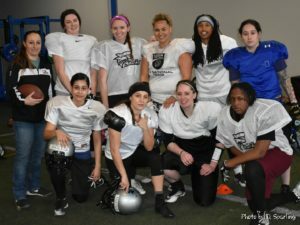 While the outcome of this game had no real playoff implications for us, it did for the Divas in terms of their ability to host their first round playoff game. 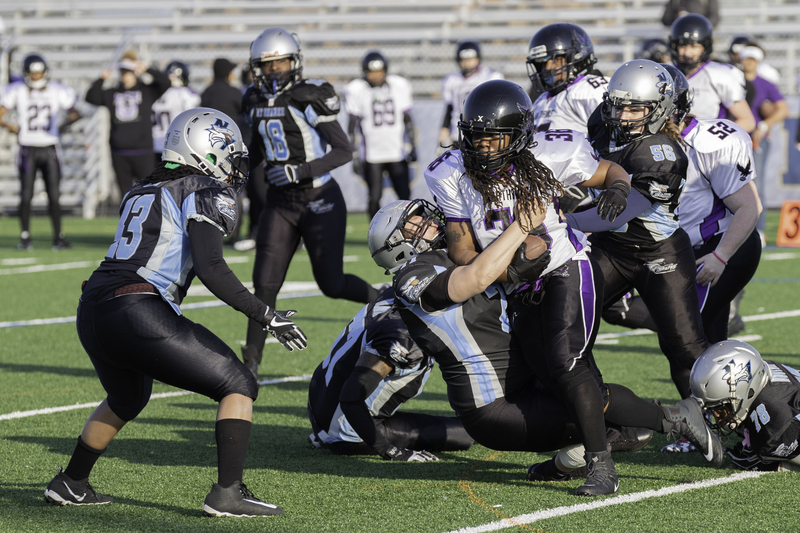 This was, perhaps, a fitting match up for the “FINale” regular season game as both of our organizations have a long, storied history in women’s football that spans the past 17 years. Specific playoff information will be posted as soon as it becomes available to us from the league. UNTIL THEN, AS ALWAYS…… ALL FINS UP, UP, UP!!! 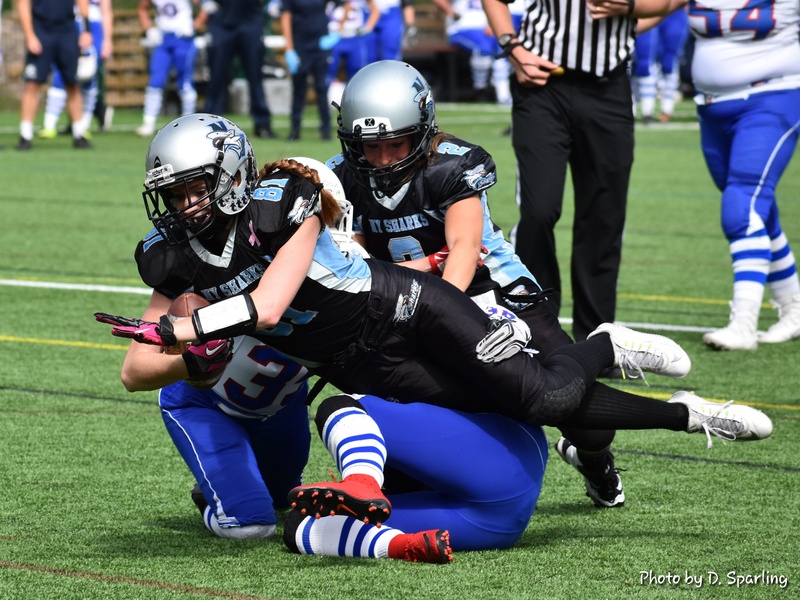 When it was all over, the Sharks scored a total of eight times on the Hawks – seven of which came from the right arm of QB Karen Mulligan on touchdowns to five different receivers. The eighth score came from Nhandi Brown on a 57 yard punt return with 4:14 left in the game. Both Brown and Mulligan set new individual Shark records on this night as well: Brown achieved the Most Punt Returns in a single season with three; Sixteen year Veteran Mulligan, achieved the Most Passes for Touchdowns in a Single Game with seven. 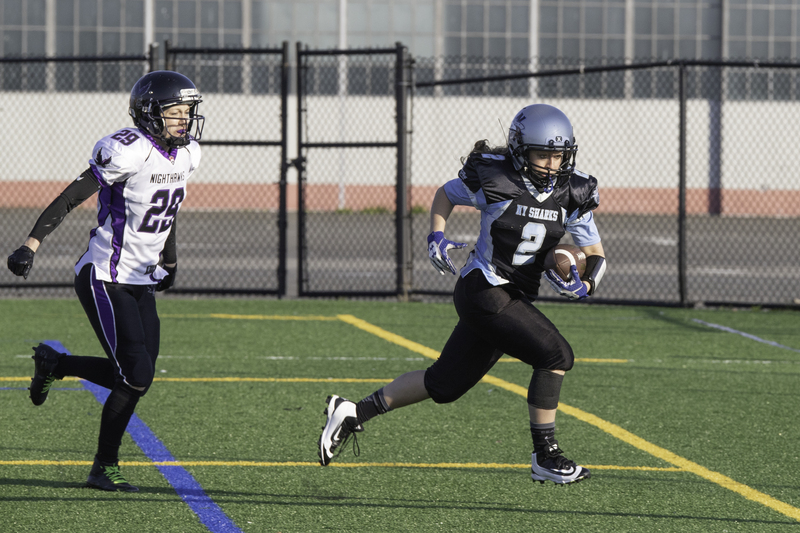 Receiver/Kicker Maggie Natell had a stellar night as well, scoring three touchdowns and five extra points. 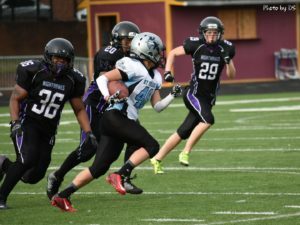 Defensively, the Finned Ones had a very strong performance with three turnovers and holding the Hawks to just one touchdown. 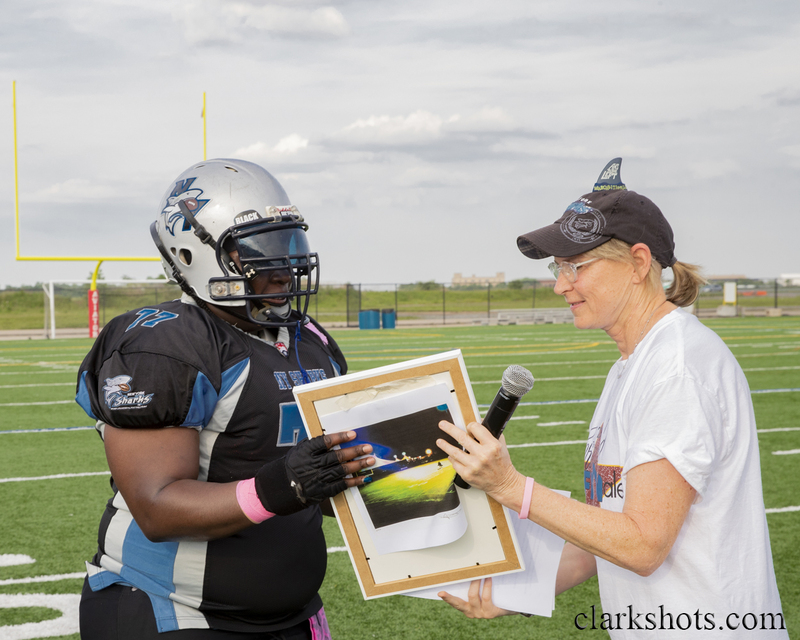 Longtime Defensive Linewoman, Nikki Joseph, reached her landmark 100th game with the New York Sharks!!! We all congratulate Nikki for her many years of great on-field contributions and loyalty to the organization. Ever steady and reliable, center Dayna Moneta received Game Performance Honors. 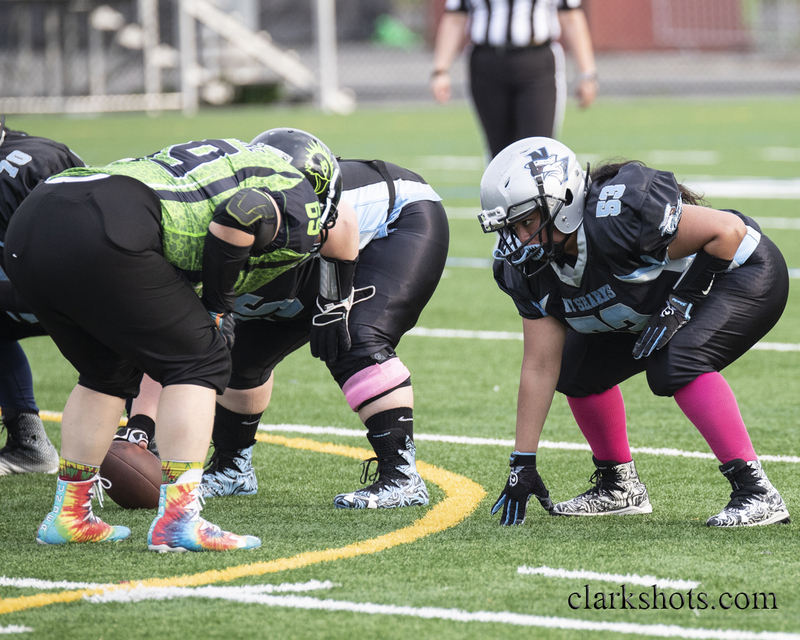 NEXT UP: Your NY Sharks head south for the final game of the regular season to play longtime rival, the DC Divas, this Saturday 6/9/18. Kickoff is at 6pm and will be streamed live from our Sharks Facebook Page. All Fins are UP, UP, UP!!! Thank you for your continued & loyal support, Shark Fans!! We expect to have playoff dates and details confirmed after this Saturday’s game. The Sharks emerged with the “W” last night, but not without some heart palpitations, nail-biting, and breath-holding. The game broke a record in it’s length – nearly 4 hours. Several injury stoppages were the cause. Key plays in critical moments came from the likes of receivers Gina Capardi (Game Ball Honoree), Jen King and Chelsea Alt; Rookies Niamaya Outlaw (Safety), Clair Funderbirk (Defensive End); and the extra point consistency of kicker Maggie Natell. 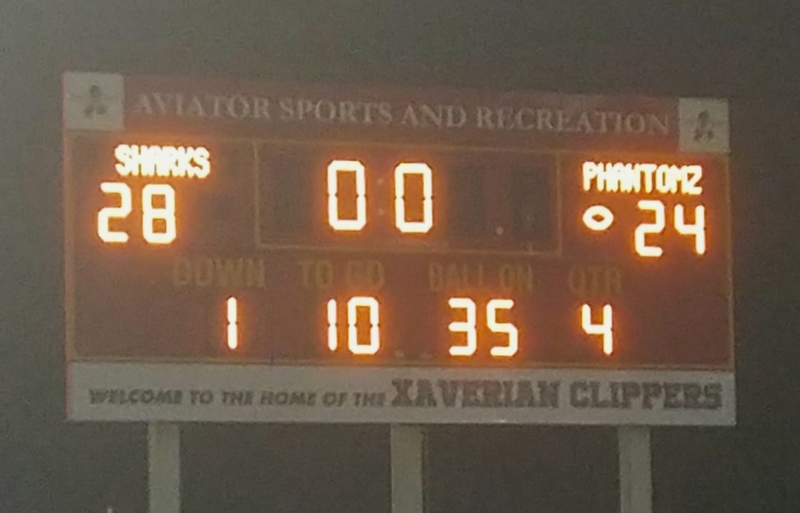 The Phantomz, while low in numbers, played like warriors and fought until the clock struck 0:00 for just one more score, but were held off by the Shark’s defensive squad. NEXT UP – Bye Week this coming Saturday for the Memorial Weekend Holiday. 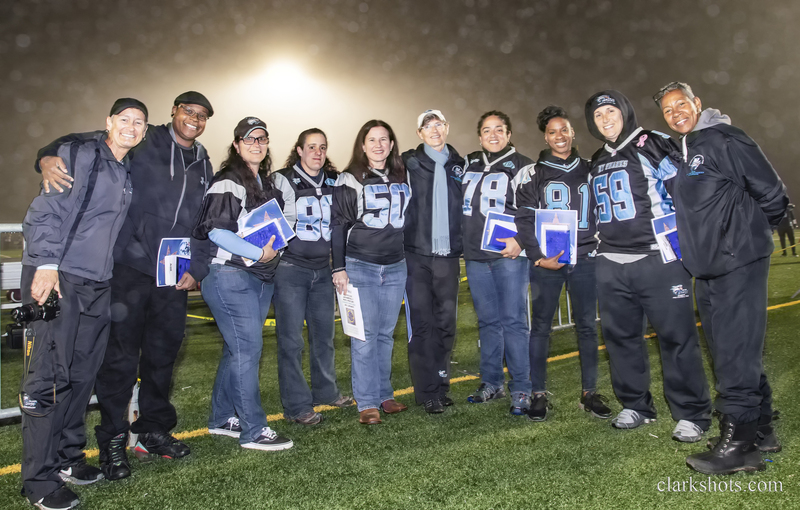 The Class of 2018 NY Sharks Hall of Fame recipients were officially inducted during halftime last night in a special ceremony presented by Owner, Andra Douglas. It was wonderful to catch up and laugh together as we recollected great “Shark Moments” from the past. Each of our deserving honorees is doing well and continuing to succeed in their lives. We are proud of each of you and congratulations on your well-deserved honor. WE LOVE OUR SHARKS !! 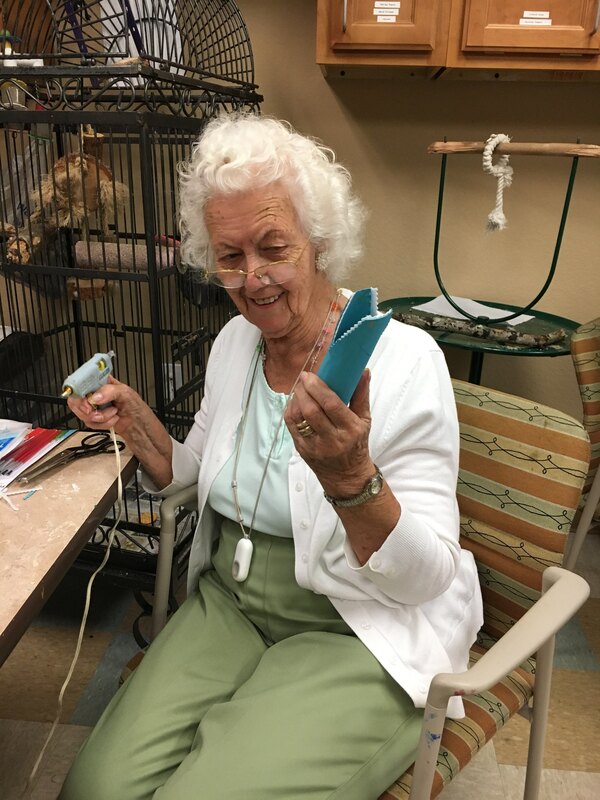 Owner Andra Douglas came bearing some very special gifts for all of our Finned Ones this past Saturday – handmade sharks !! 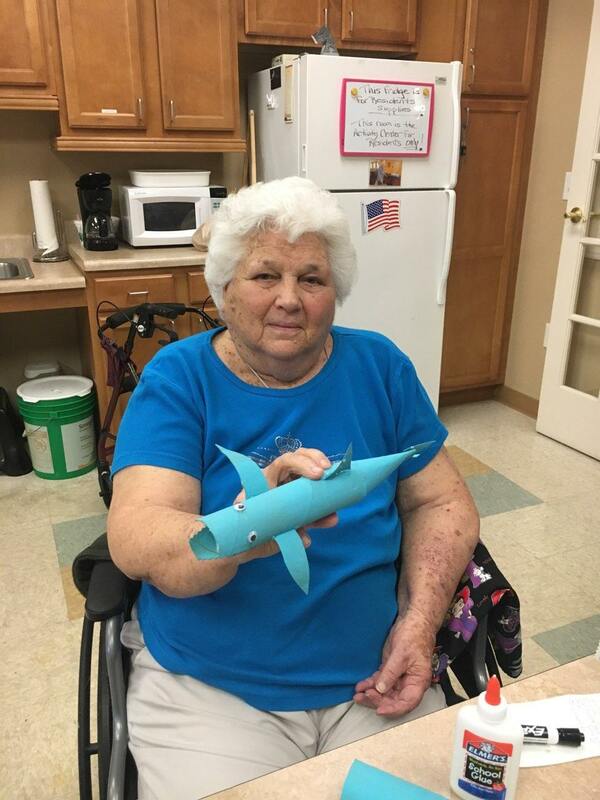 Some pretty awesome folks made these personalized, mini-sharks in their craft room at their senior living residence, led by the mother of our owner, Christine Douglas. 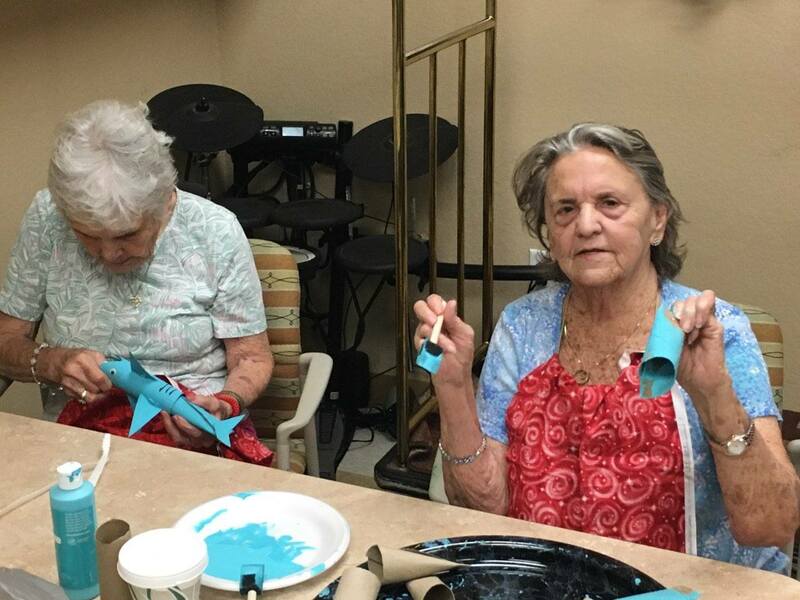 Among the crafters was Christine’s lifelong neighbor and friend, Raybelle Surratt and also Trudy Greco. We thank you from the bottom of our Black and Blue Hearts for your beautiful gifts!! Fins UP!! 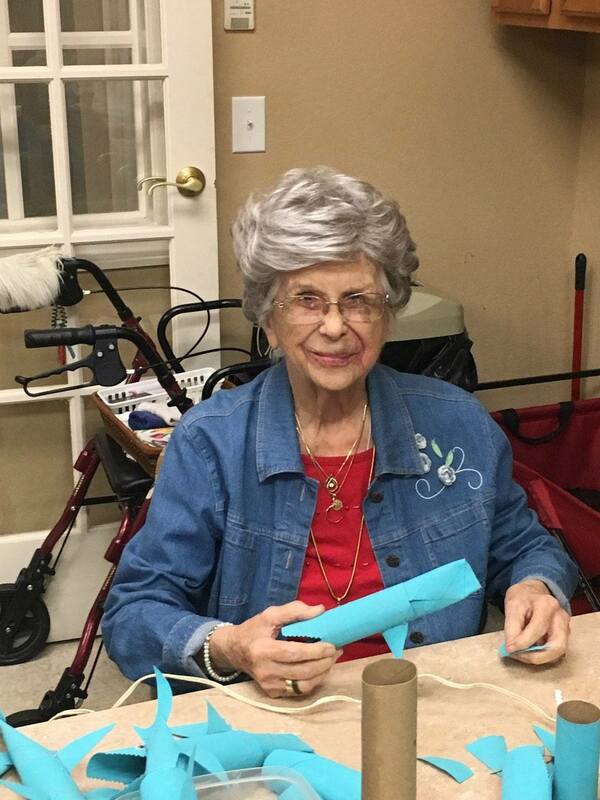 Christine Douglas, mother of our owner, Andra Douglas, in the craft room! We love you Christine!! Fins UP! 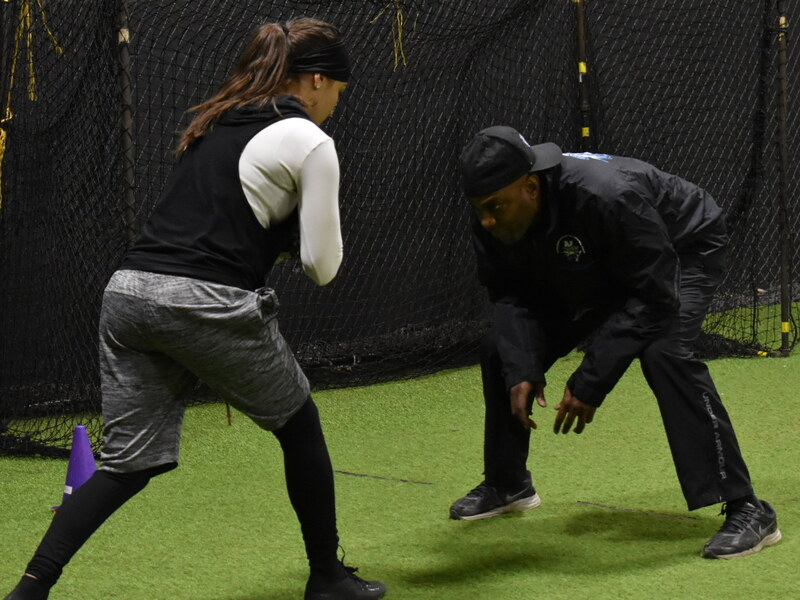 Raybelle Surratt hard at work! Calling all NYC Metro Area Girls!! A fantastic opportunity to learn football skills from some of the best is coming to our area!! The date is Saturday, June 2nd. 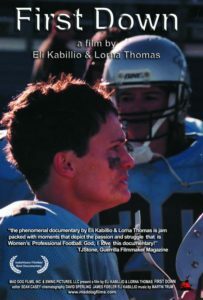 If you are a girl who loves football and are 6-18 years old, check this out!! On a night with weather that we could have all done without, both teams battled through a steady rain from kickoff. In spite of all the forecasts indicating not only no rain, but no thunder or lightning – it happened. All of it. 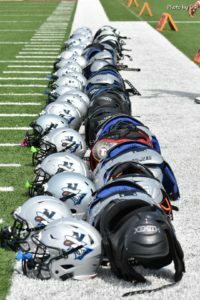 When several lightning strikes were seen in the sky, due to Aviator Sports and Events Center’s safety policy, the game was called, just into the 3rd quarter. 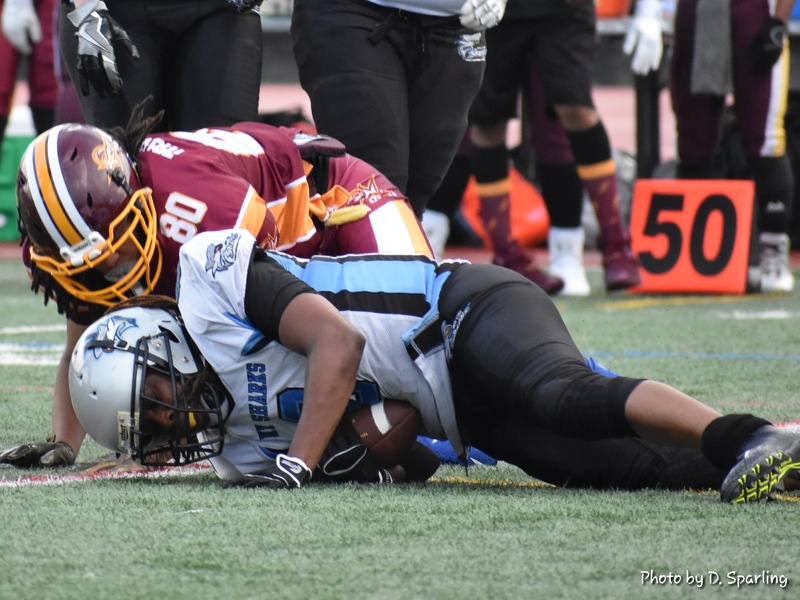 As per WFA league policy, due to the fact that the minimum of two quarters of full play had been completed, since Boston was in the lead 21-0, they left with the win. While putting safety first is never a question in our minds, of course this left our Finned Warriors nothing short of frustrated as they came out at halftime ready to try and battle back, only to be stopped short by nothing any of us could control. A tough night for sure. 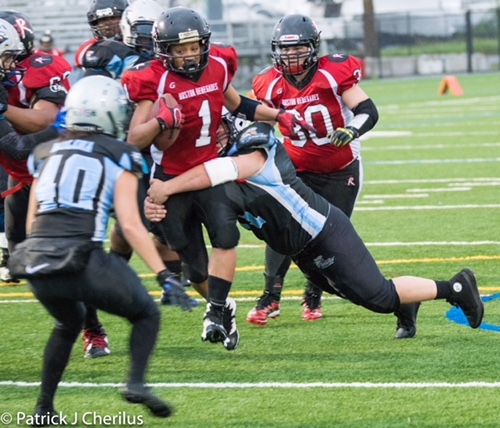 The Sharks are now 4-1 and in 2nd place overall in WFA Division 2, per Massey Rankings. 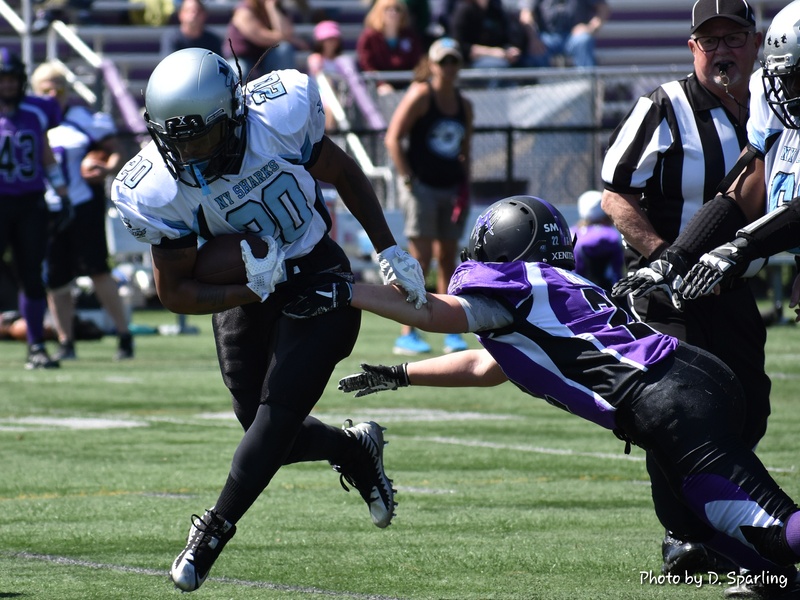 The New York Sharks move to 4-0 as they claimed their first shutout of the season at the Maine Mayhem on Saturday. Sticking to a running game, the Mayhem, while maintaining possession for nearly the entire 1st quarter, couldn’t get past our defense to score. That trend continued until the clock struck zero. While our Sharks had a slow start in the 1st quarter offensively, they jumped into gear in the 2nd quarter and never looked back. The Sharks came charging out of the gate in the first quarter, racking up 35 points in a seemingly effortless manner. 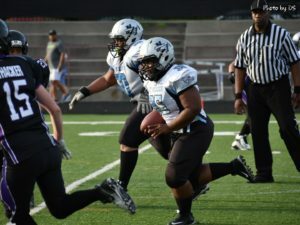 As the Sharks’ defense held Baltimore from the end zone until the very last minute of the 2nd quarter, the offense saw touchdowns from four different players in the first half and two others in the 2nd half. 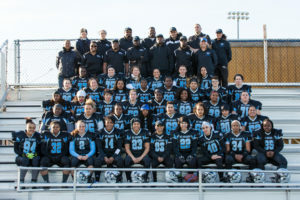 Gina Capardi had two passing touchdowns from QB Karen Mulligan; Nhandi Brown returned a punt 60 yards to score; Trini Gordon-Edwards ran the ball in from 13 yards out for 6 points; and Maggie Natell not only put 6 on the board on an 86 yard run, but made every single one of her extra point attempts for a total of 7 points on the board for the Sharks. Second half scores came from returning veterans Brilynn Fields and Gaby Nazaire. The Sharks now stand at 3-0. 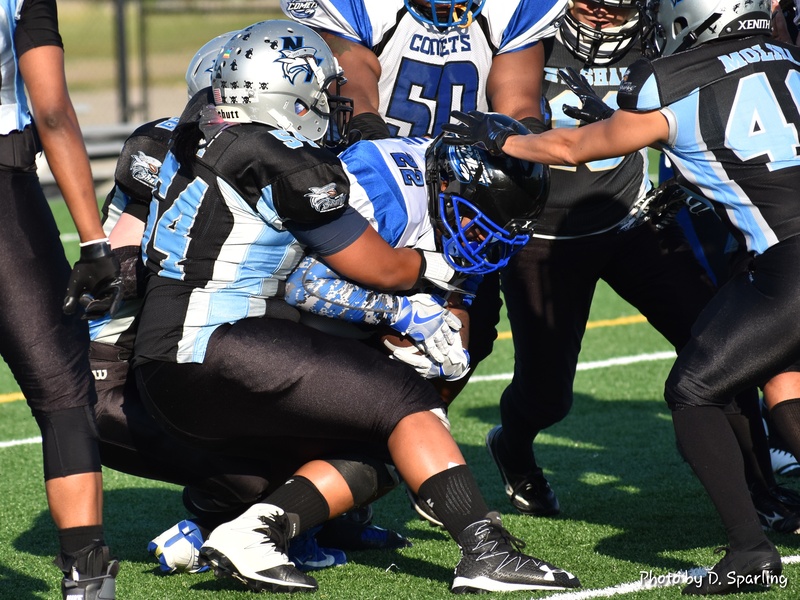 Click on the link below for the detailed Scoring Highlights from the Baltimore game. Dr. Carol DeCosta lived a life dedicated to the service to others, specifically in the medical field. She served as our Team Doctor in the early years of our organization. An accomplished individual both professionally and as a human being, she will be missed. 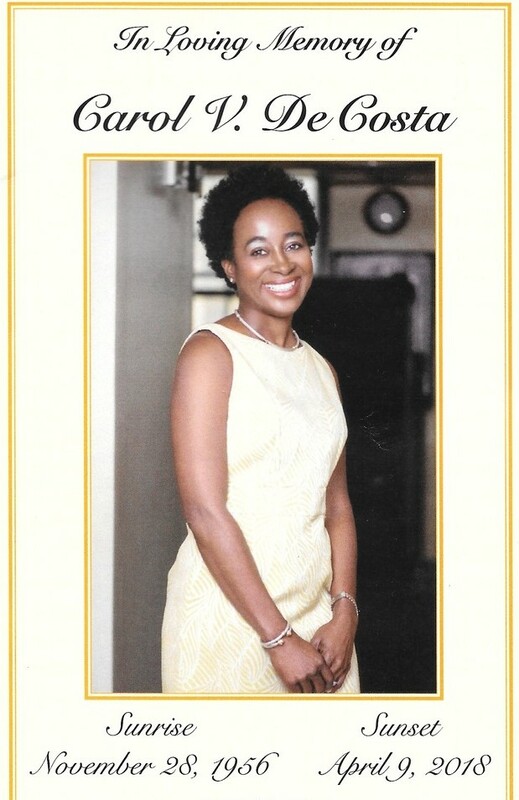 We extend our deepest condolences to her family, friends, and all who loved her. May she rest in peace. 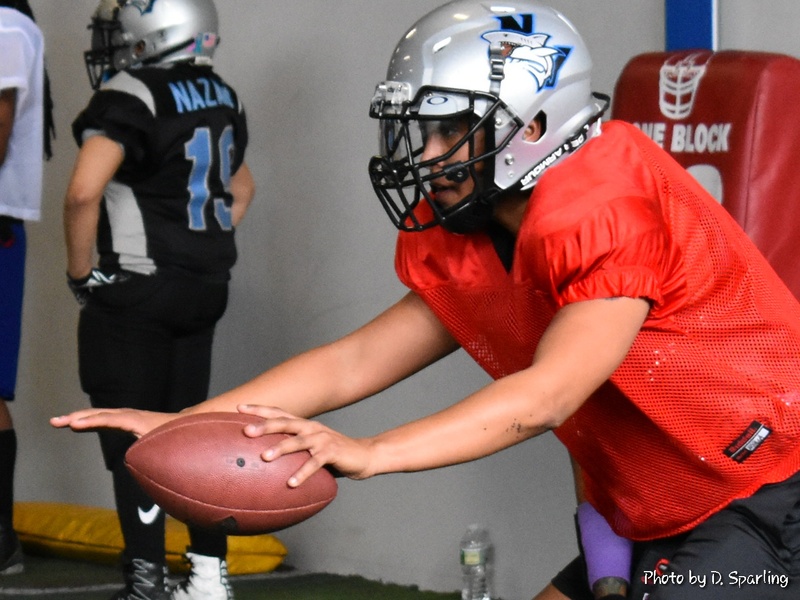 The Sharks will be busy preparing for our first HOME GAME of the 2018 season where we will once again hit the gridiron against the Baltimore Nighthawks. 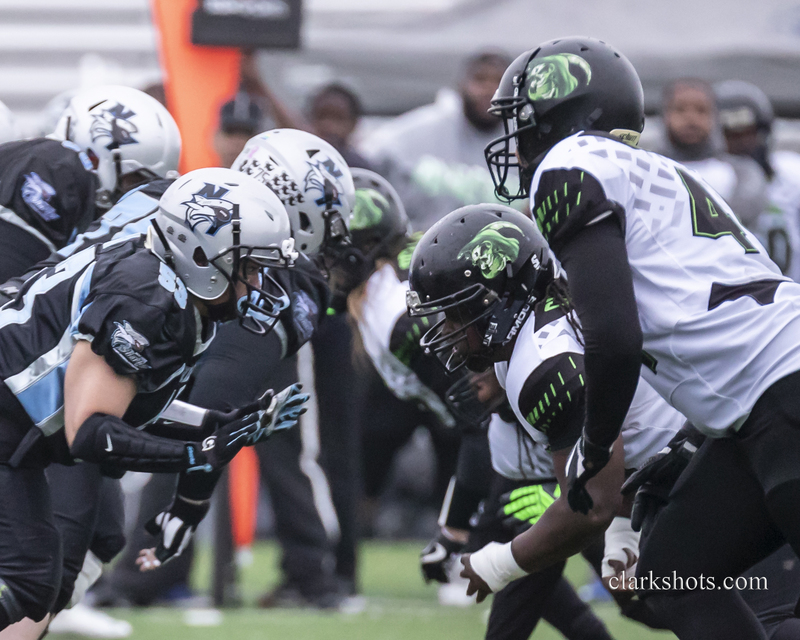 Week two found the Sharks in another nail-biting match-up against local rival, the Philadelphia Phantomz. The Sharks played a steady 1st half, then turned it up several notches in the 2nd half both offensively and defensively. 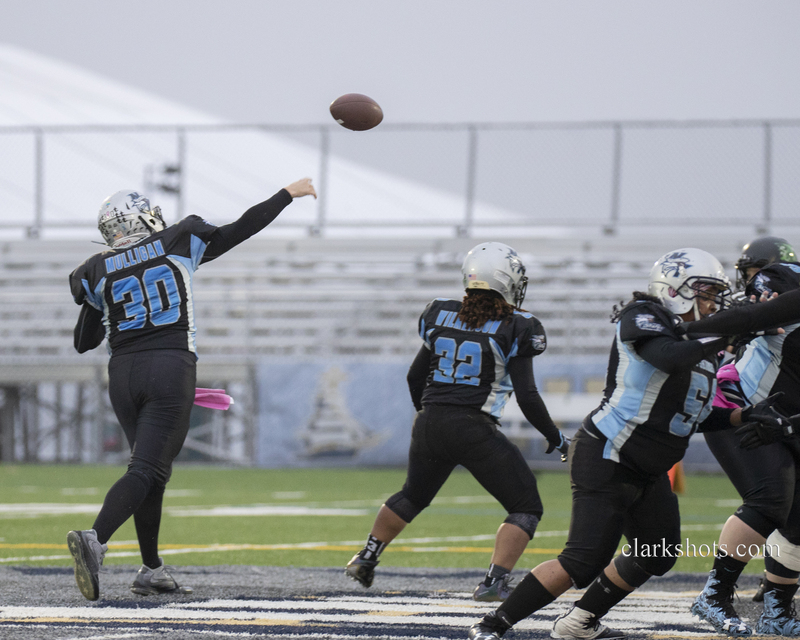 In the end, with just over one minute to play, a beauty of a connection between QB, #30 Karen Mulligan and #5 Jennifer King put the Sharks back in the lead and the defense held down the fort until the clock hit zero! The Sharks move to 2-0 as they head into a bye week. 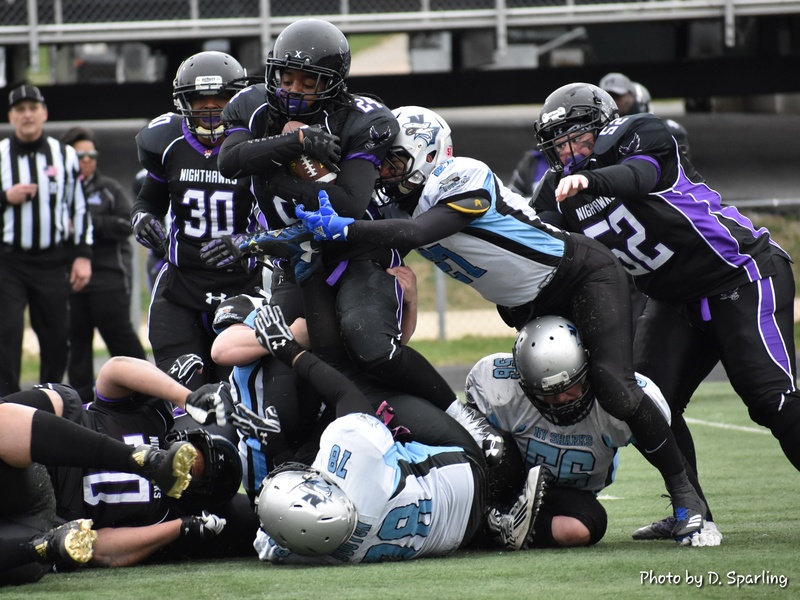 In a game that defined “Nail-Biting,” our Sharks pulled off a narrow victory over the Baltimore Nighthawks in the first week of the 2018 season. Baltimore put the first points on the board as the lead exchanged hands throughout the entire game. 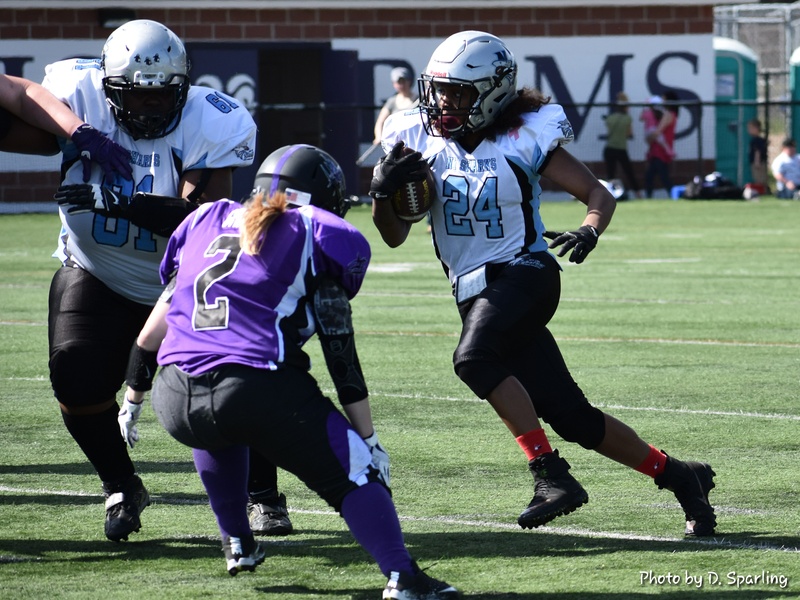 Standout performances included those by #81 Maggie Natell with three of the Sharks’ touchdowns; #56 Gabby Farrell tackling Nighthawks through out the game on defense; and stellar moments by #40 Krystal Molina and #18 Nhandi Brown on Special Teams. Online Store – Open for Business!! A Sneak Peek at your 2018 NY Sharks!! The Artwork of Sharks owner, Andra Douglas, is currently on exhibit in St. Petersburg, Florida through March 15th, 2018. 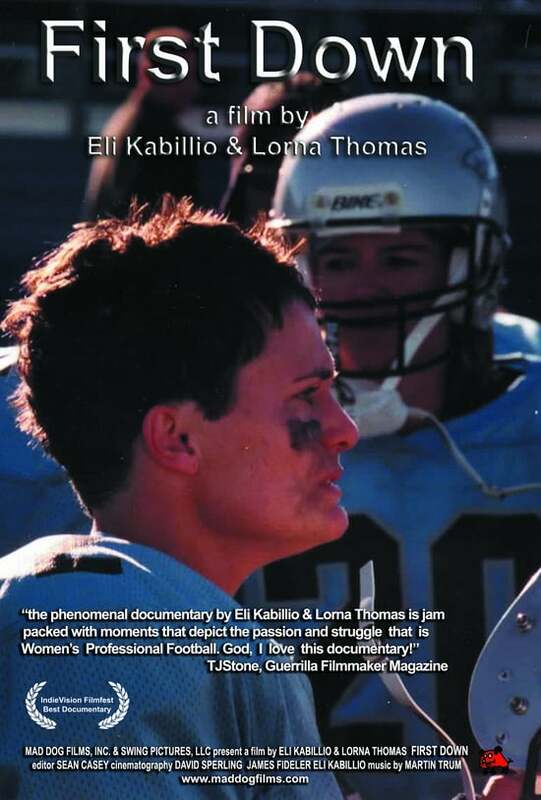 The images captured are of those who are so passionately involved in the sport of women’s tackle football. We proudly share the link below with you. 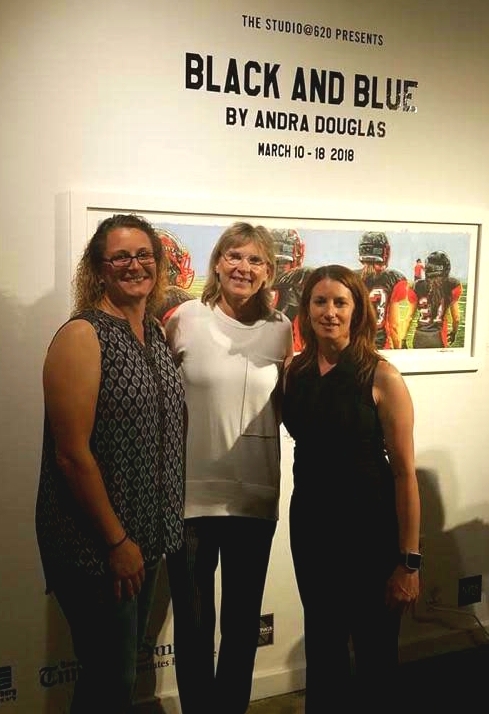 The art work of Sharks owner, Andra Douglas, is currently on exhibit in St. Petersburg, Florida from March 10th through the 15th! Having captured the images of those involved in women’s tackle football from around the country in the past several years, her unique, mixed media artwork will be on display at The Studio@620. As we embark on our final season as the NY Sharks, we will be reaching back through our “herstory” and sharing many shining moments with our supporters. 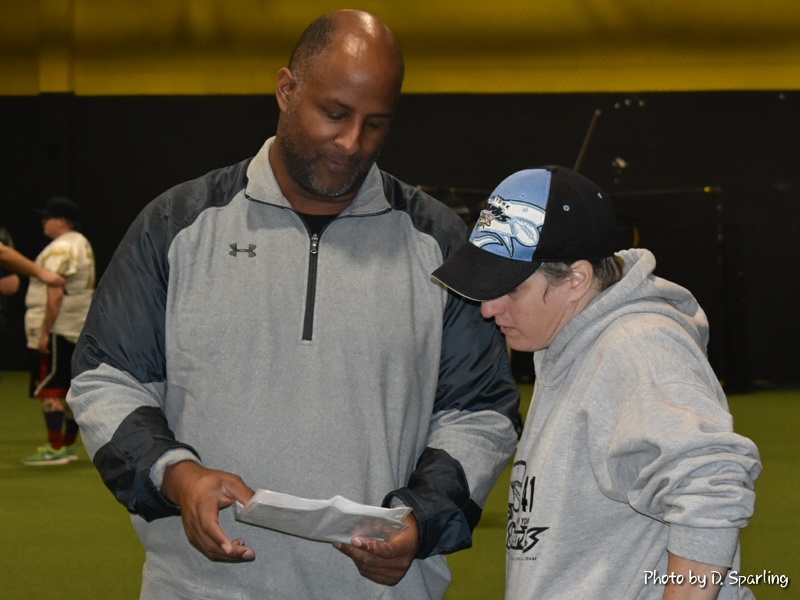 Toni Salvatore, shown here, collaborating with Defensive Coordinator, Kyle Copeland. Former longtime Cornerback, Toni Salvatore #41, has joined the 2018 staff as the coach of the Defensive Backs. We are excited to have Toni on board with us for the Grand FINale Season!! Loyal shark fans! 2018 is the Year of the Woman…and the self-appointed Year of the Shark! What a great combination! There is so much going on in Sharkland, I don’t know where to start. We have assembled an amazing coaching staff for this season, including the return of Fabian Alesandro as our Head Coach. We have an incredibly talented rookie group joining the team and most of our veteran players are returning. 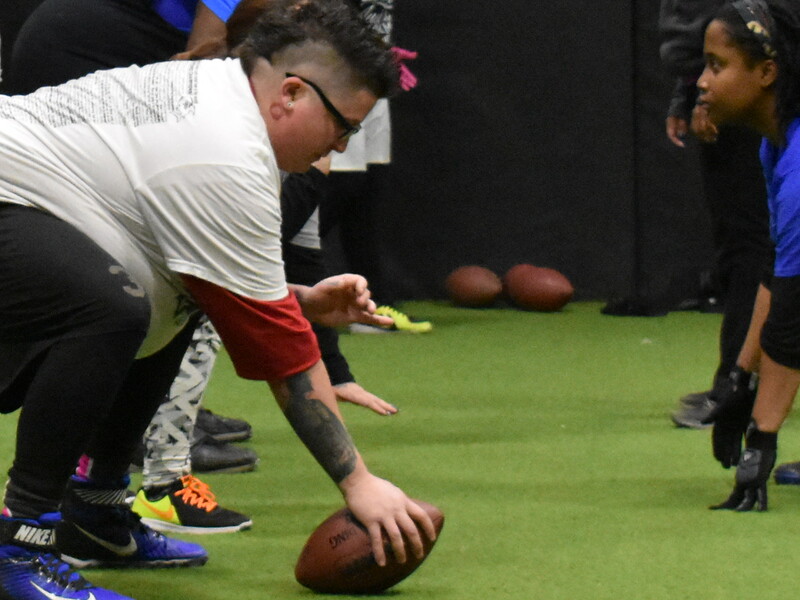 The Sharks are on a mission and this mission is inspired, in particular, by something I have to tell all of you: 2018 will be my last year as the owner of this winning-est and longest operating women’s tackle football team in history. I have sold the team, but not before the completion of what will be our 20th season this year. Beginning in September of 2018 – ​although I’ll never be far away from something I love so dearly – I’ll be moving on to other endeavors. I will be leaving the team in the very capable hands of Tom Farrell and Daniela Farrell, two people who are passionate not only about the game, but more importantly, about our team. They will take over after the close of the 2018 season. I’ll be writing more on all of this but meanwhile, the Sharks are circling for the grand FINale! We have so much planned for ​this coming ​season and one of those things is the return of our veteran QB, Karen Mulligan. 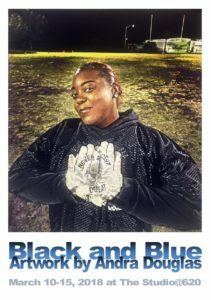 Yes, after 15 seasons she DID retire and we retired her jersey as well, but once she realized that the team had but one more season as the storied New York Sharks, she grabbed her gear, we returned her jersey from out of the frame and, well, fabulous Shark fans, we are all reunited​ for the Grand FINale season!! 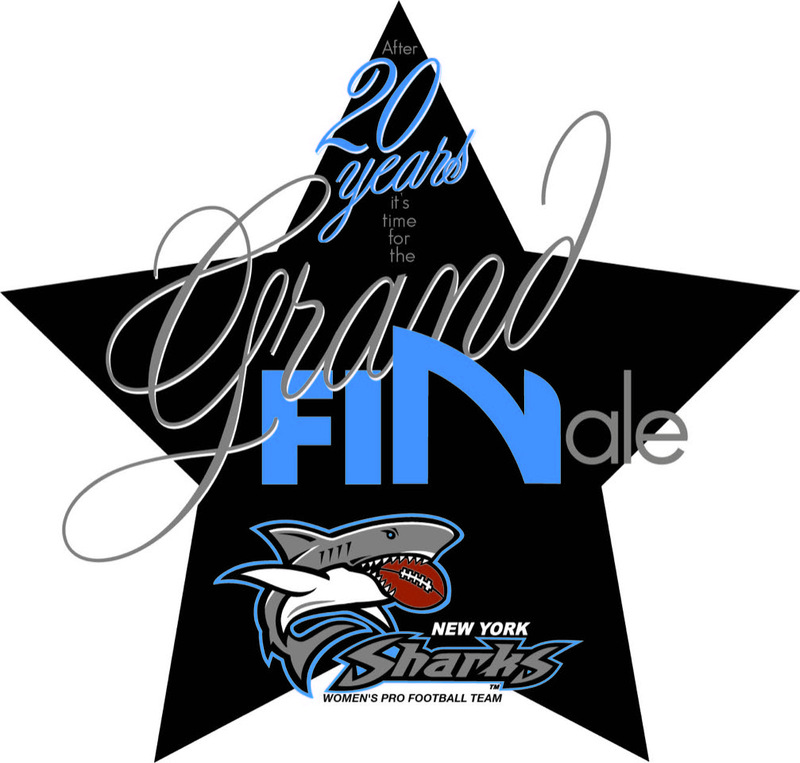 Please keep an eye out on​ both our ​Facebook​ page​, official website – www.nysharksfootball.com, and instagram for notifications of many special events planned, including the unveiling of ‘The Sharkives;’ a 20 year retrospective of the New York Sharks. 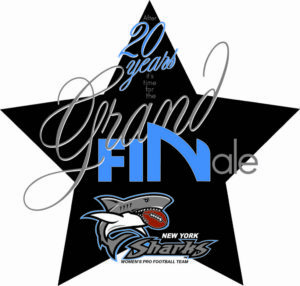 We will be holding special gameday ceremonies to celebrate previous players and staff and a helluva final banquet in which we will be inviting everyone on the all-time Sharks roster including staff and, of course, all of our beloved fans! Commemorative Grand FINale merchandise will also be available for purchase in both our web store and at home games. NY Sharks Owner, Andra Douglas, was interviewed recently on Tom Maoli’s nationally broadcasted radio show GO BIG OR GO HOME. We have shared the interview below. YOUR NY SHARKS ARE BACK IN THE WATER! 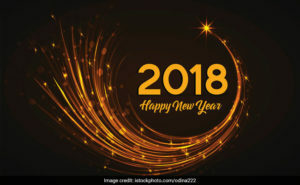 The New York Sharks organization would like to wish all of our fans, families, and friends a New Year full of joyful, epic moments too numerous to count. We are grateful for each of you and may we all enter 2018 with our Fins Held High and ever hopeful of wonderful things to come – including a 2018 Championship!! 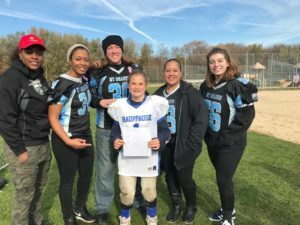 Your NY Sharks showed up recently to support yet another young, female tackle football player on Long Island. 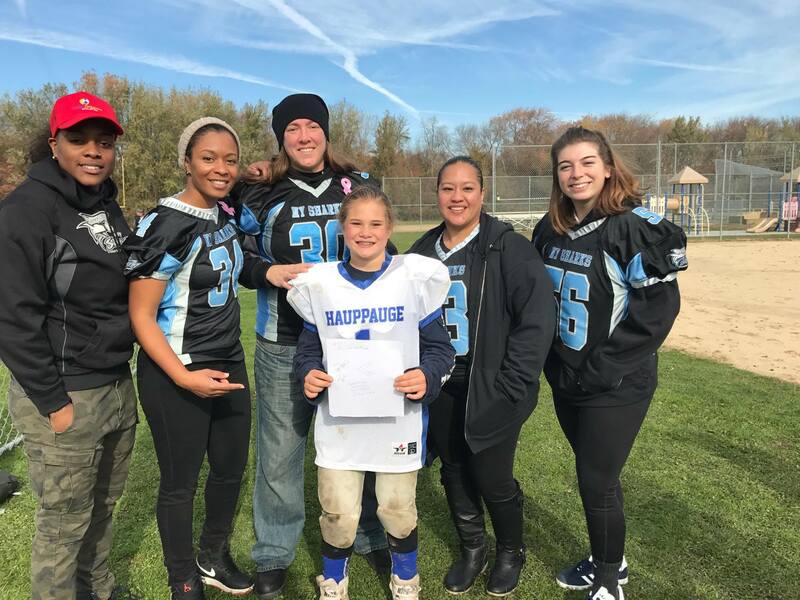 Taylor is 9 years old and plays on the Hauppauge PAL tackle football team. Showing up for her were Gabby Farrell, Karen Mulligan, Edie Sosa, Kareen LaCroix and “Trini” Gordon-Edwards. 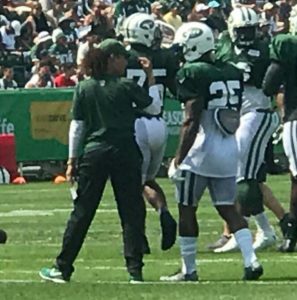 Note to our Followers – This story was originally “leaked” by an outside source back in late May, 2017 – prior to the official announcement by the New York Jets organization (see story link below from late May). This put Collette Smith and the Sharks organization in a precarious P.R. position. Some confusion followed on when we could officially announce this news without putting Collette in an awkward spot with the Jets organization. This is the reason for the delay in reporting this amazing news. Thank you for your understanding. It was no surprise to me when Collette Smith called to tell me that the New York Jets had picked her up as an intern. Collette Smith has been a part of the New York sharks since 2011. 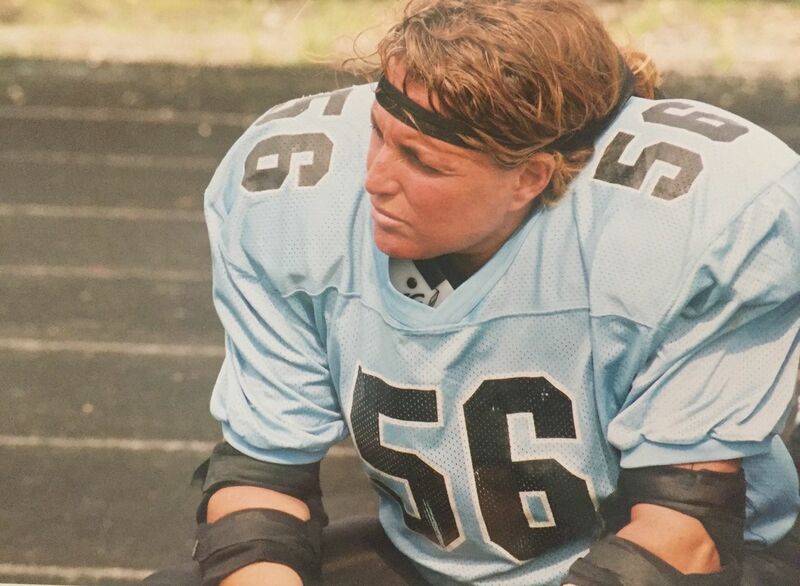 I still remember the phone call I received from her when she discovered that the New York sharks existed and dialed the number to find out what she had to do to get on the field. We must’ve talked for an hour and a half about how wonderful it was that women were finally playing organized tackle football. We commiserated about our younger days when there were no teams in existence and playing on the boys teams was not always possible. We talked about how life altering it can be when people are allowed to live out life long dreams. 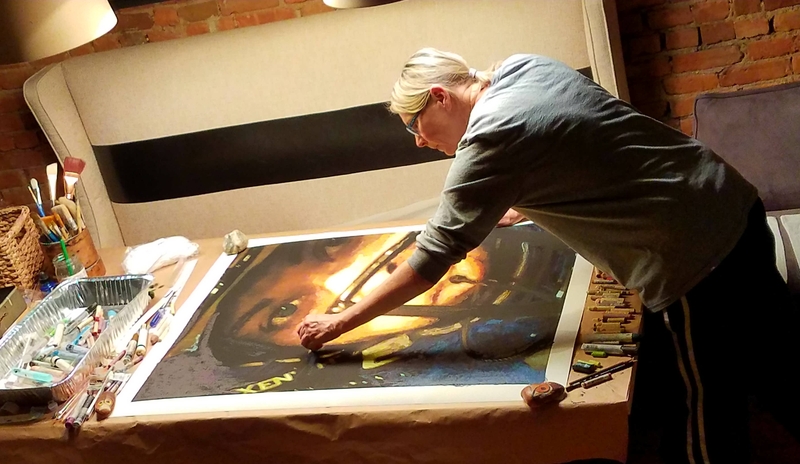 Fast forward—Collette is one of those people whose life has changed because of her dream and this wonderful sport. But, as I said, I’m not surprised. Collette is very hard working, outgoing and wears her heart on her sleeve. 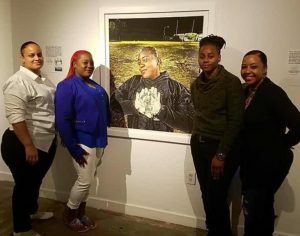 She believes her truth—that women are strong and can do anything—and has a wonderful way of engaging others to join her journey. As Collette will tell you, she was changed forever the 1st time she got the chance to be on the field for a game. It was the highlight of her life and since then, her goal has been to positively impact the lives of girls and women. I’ve always told my team that what we do is so much bigger than football and Collette is the prime example. 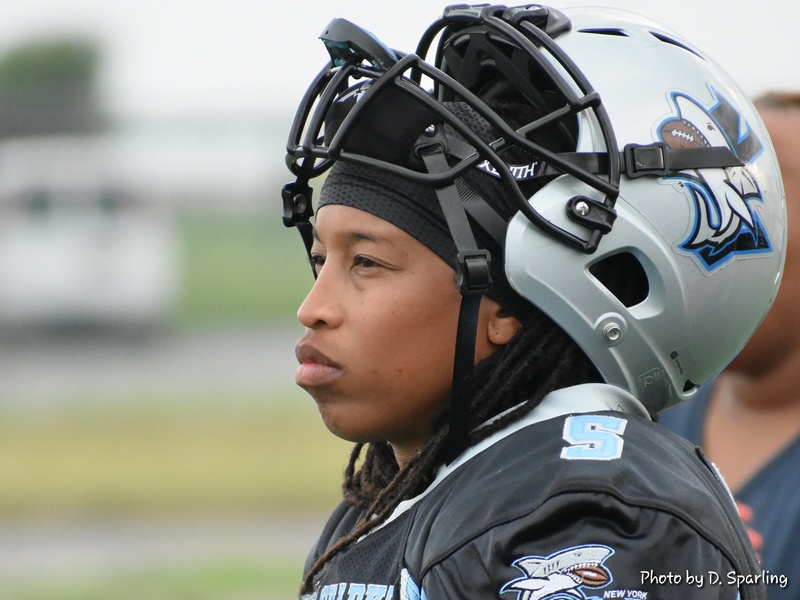 When a double knee injury ended her time on the field, Collette still showed up at practices and on game days to support her team. The following year when she was on the injured reserve list, Collette was always there. 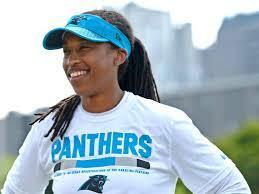 Several of us in management talked about adding her to the coaching staff and suggested the idea to our coaches. Shortly after that, Collette was a coach with the NY Sharks. She dove into the job 100% which is Collette’s norm. She never missed a practice, was eager to learn and earned the position for 3 more years. 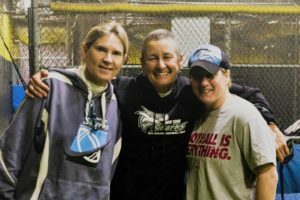 During her time as a coach, she never missed an opportunity to promote the team. She showed up at any function where she thought the Sharks could benefit from exposure. She was relentless and effective. Upon seeing yet another talent displayed by Collette, I offered her the position of Director of Marketing and Public Relations. She accepted and, once again, excelled. Within a week she had a seat at the CBS Station for an interview to talk about Women’s Pro Football and the NY Sharks and has had many other networks respond to her efforts including NY1 News, Fox 5, PIX 11 News and Brooklyn 12 News. Due to Collette’s efforts, Ashton Kutcher’s company, ‘A Plus’ has featured the Sharks in a campaign to bring awareness to Lupus. We are also associated with the Make-A-Wish foundation, better acquainted with the New York Jets, and have attended numerous high profile functions to increase the awareness of our team. She earnestly implores those around her, whether it’s the Sharks players or strangers on the subway, to believe in themselves. 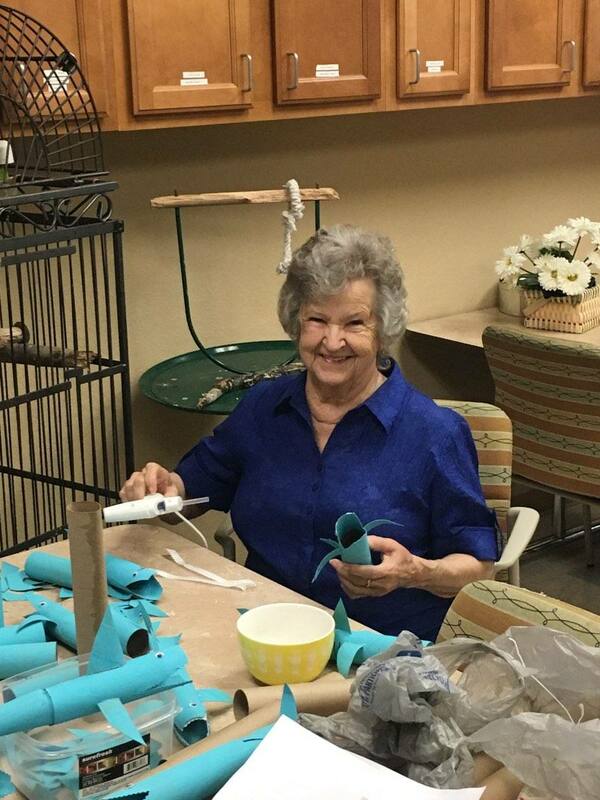 She doles out positive energy in endless supplies and her enthusiasm is epic. 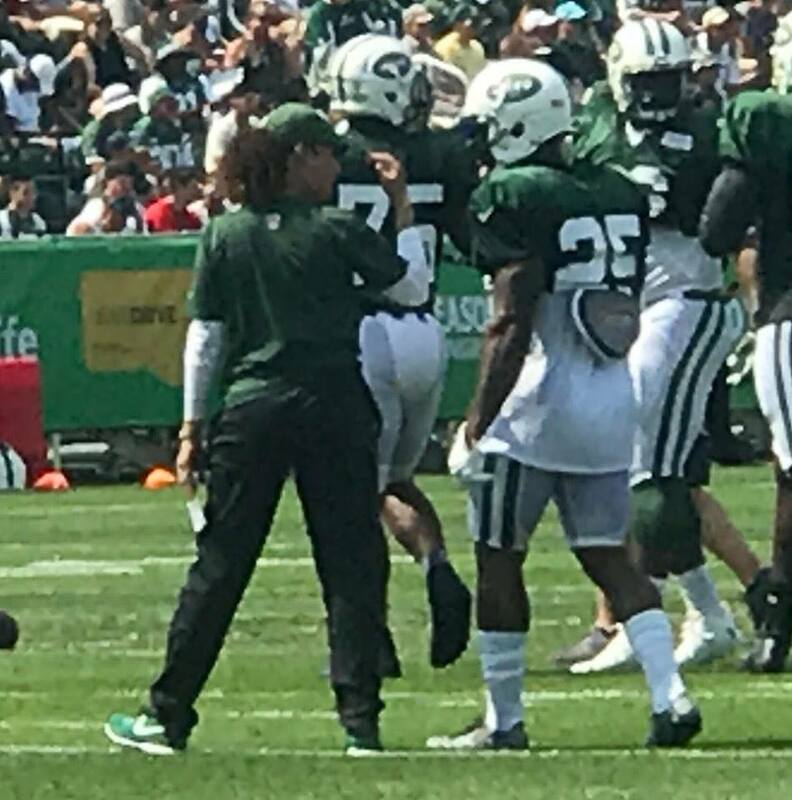 So no, it is not a surprise that the New York Jets organization saw her spark and felt she could ignite some things for them as well. Everyone at the New York Sharks organization is so proud of our own Collette Smith, not only because the Jets have acknowledged her talents, but because of everything she has done and continues to do for us. Congratulations Collette! Keep believing. Keep dreaming. Keep knocking on those doors. Your finned family is behind you and cheering you on! From all of us in the New York Sharks organization, we extend our deepest gratitude for your unwavering support this past 2017 season. You are The Best!! 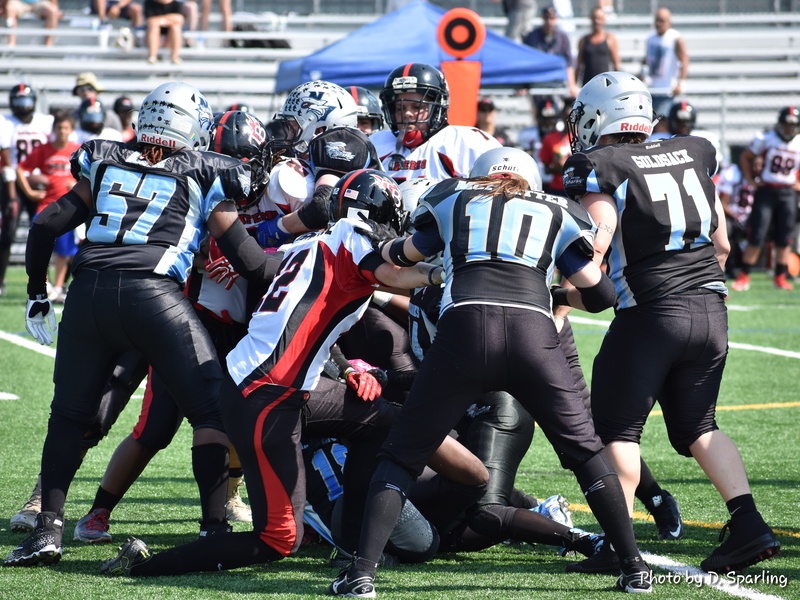 In a battle for the ages on the gridiron this past Saturday, June 17th, 2017, your NY Sharks left everything they had on the field in Montreal. The final score – in this 3rd meeting between our two teams this season – was 49-27. Montreal emerged victorious and will now move on to play (and host) the Tampa Bay Inferno in a 3rd round playoff match up on July 8th. Your New York Sharks came out “firing on all Fins” this past Saturday – in 95 degree heat – and handed the Philadelphia Phantomz a very different outcome from their first meeting earlier this season. The team was effective on both sides of the ball in a game where the lead changed hands more than once which made for a very exciting contest. 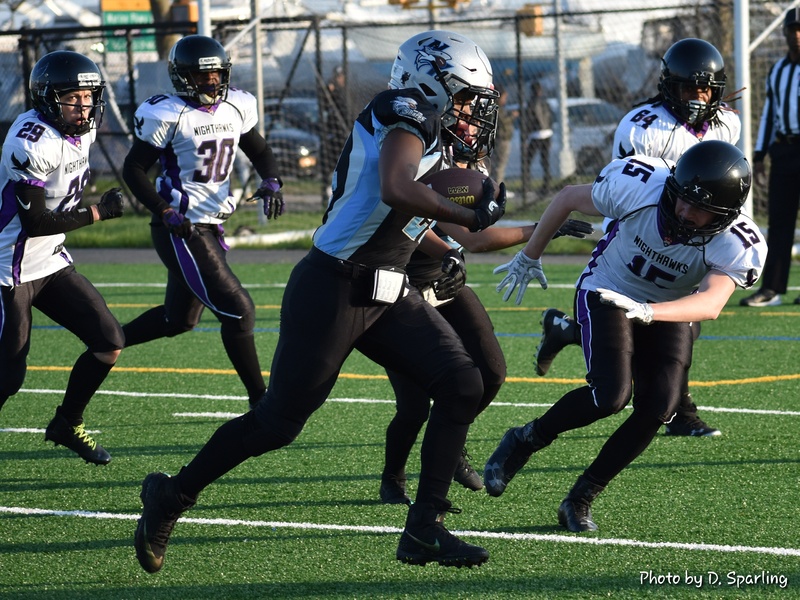 This victory will once again pit the Sharks against the Montreal Blitz for a 2nd round playoff game this Saturday, June 17th. This will be the 3rd meeting between these two teams this season. Special thanks to the many faithful Finned Fans who made the drive to Philadelphia to support us in the blazing heat!!! We appreciate you all!! 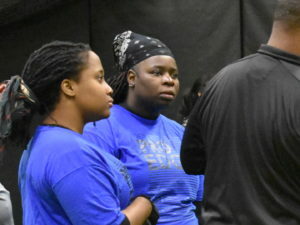 Running backs Janea “Bam-Bam” Wilkerson and Hadiisha Butts discussing strategy during pregame. 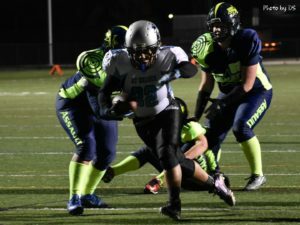 Your Finned Ones pulled off a narrow victory with 15 seconds left in the game on a night that had everyone swimming for the football in a soaking rainstorm during the entire second quarter. 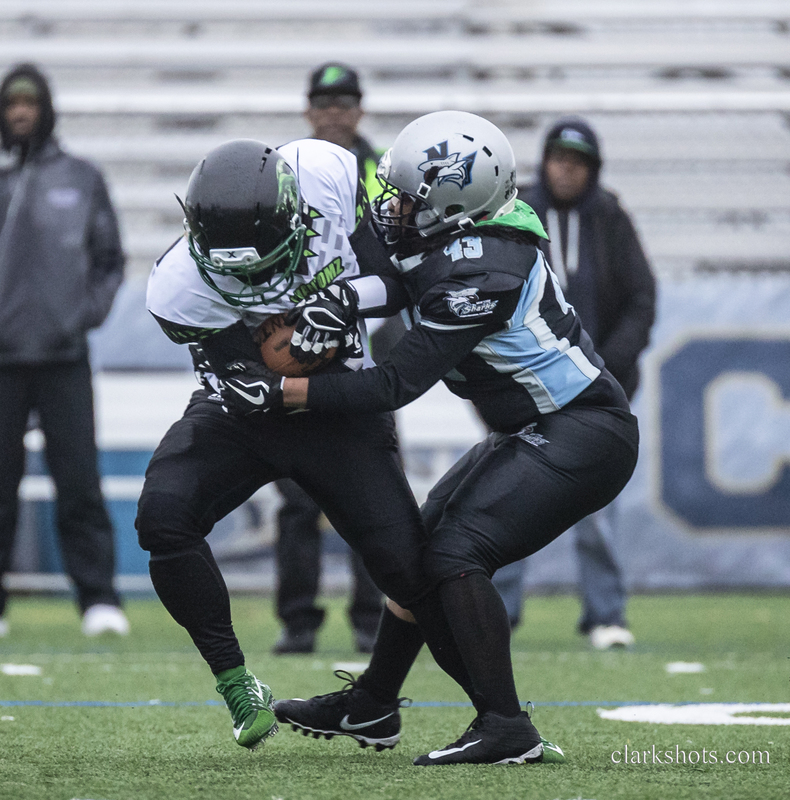 “TeeJay” Grimsley #33 put the Sharks’ only touchdown on the board with a 10 yard run near the end of the 4th quarter. 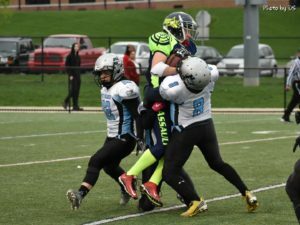 After a narrowly missed extra point, Maggie Natell #81, saved the game on a beautiful field goal with 15 seconds left – even after an attempted “time-out-icing” by the Fusion. Sharks do what they do….TOGETHER !! 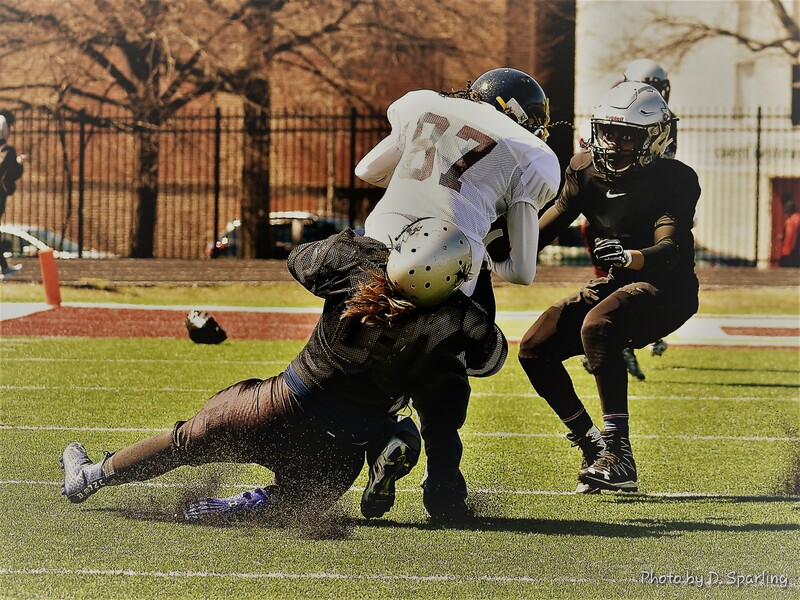 Shark defenders Shani Espinal and Nhandi Brown take down a Cleveland Fusion player in last Saturday’s game. Your New York Sharks came out strong and played that way until the clock hit 0:00 on Saturday night. The passing game was the means by which nearly all 54 points were scored. 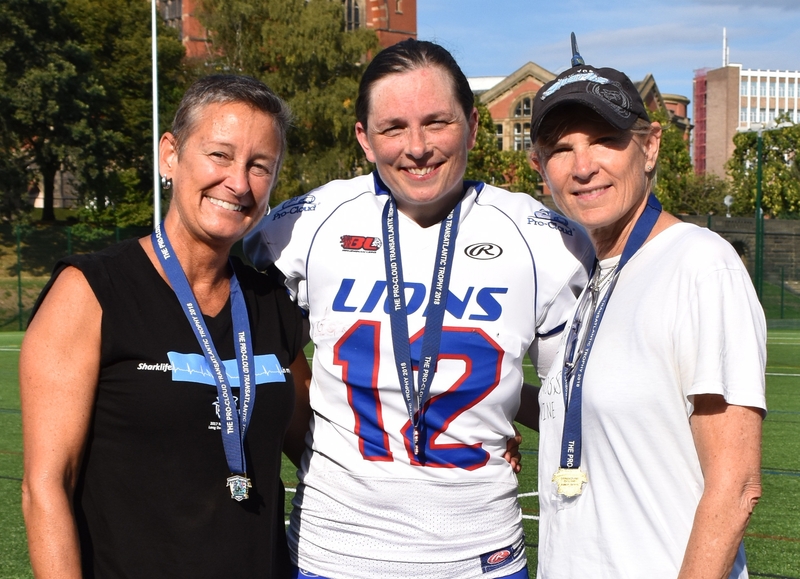 Game balls went to #30 QB Karen Mulligan, #22 Kareen DeJesus and Amy Deal – who stepped back on the field with the temporary loss (due to injury) of linebacker Gabriella Farrell. 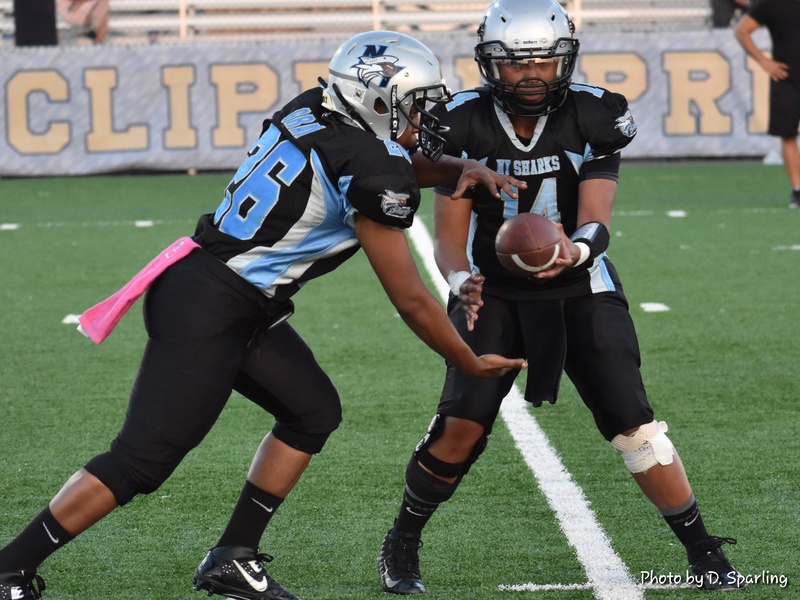 Karen Mulligan tied her previous record or 6 touchdown passes thrown in a single game. The depth of offensive talent revealed itself as touchdowns were scored by #25 Brilynn Fields, #81 Maggie Natell, and #32 Janea “Bam-Bam” Wilkerson . 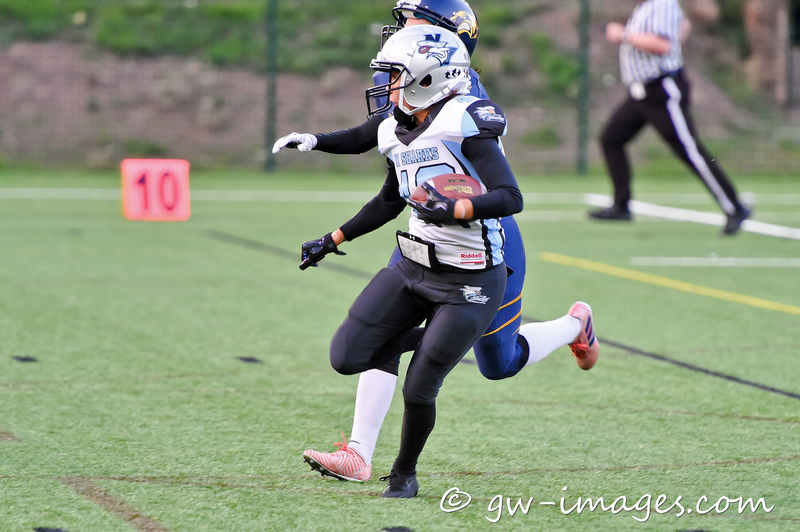 Add to that, 1st career TD’s by rookies #14 Danielle Ayala (2 total) and #29 Danielle Laiken. Your NY Sharks came up JUST short last night against the DC Divas at Aviator Sports and Events Center in Brooklyn, NY. 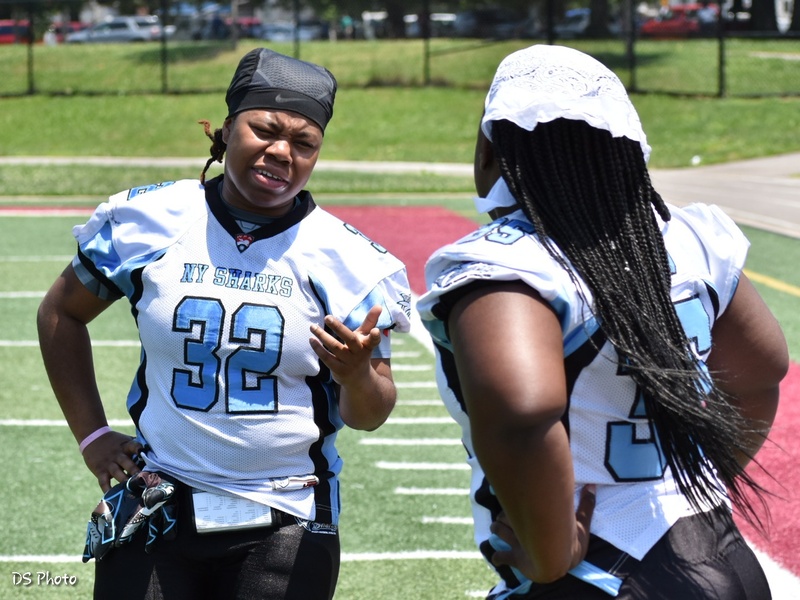 The Divas went up 21-0 by midway through the 2nd quarter and into halftime. 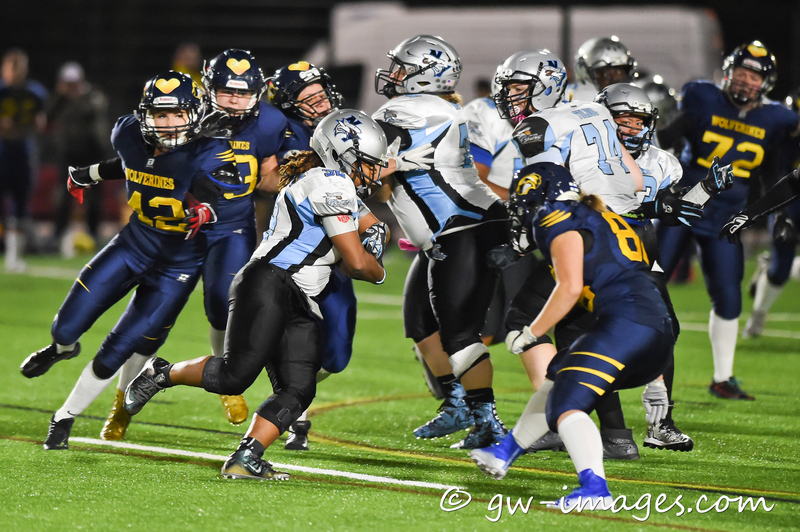 The remarkable measure of the shark players’ mettle revealed itself, however, when they scored three touchdowns – in the 4th Quarter. This “never-give-up” attitude is something for which our players should be proud!! All Fins UP! HOME GAME TICKETS – AVAILABLE ONLINE NOW!!! NY1 covers your new york sharks! Several of your New York Sharks traveled to Orlando, Florida in January to try out for the National Women’s Tackle Team that will play in Langley, British Columbia at the end of June this year. The Roster was finally released and while all of our Finned ones didn’t make the team, we are extremely proud of each and every one of them! All Fins UP!! The Sharks ownership and management are proud of the courtesy, professionalism and respect shown by all parties involved, and effected by, this necessary business decision for our organization, especially with being so close to the start of the 2017 season. 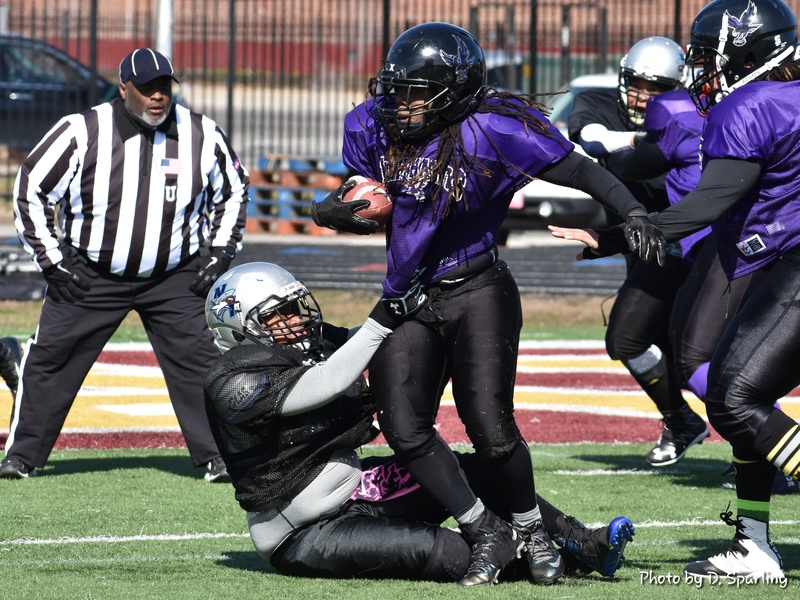 “While I have much respect for both the IWFL and the WFA, it is in my team’s best interest to rejoin the WFA for the 2017 season. It is unfortunate that the costs associated with women’s football too often dictate decisions. 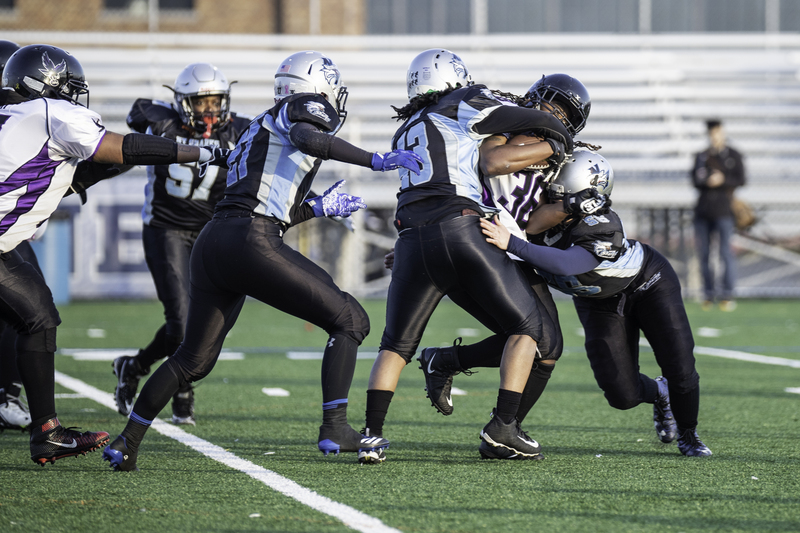 We wish the IWFL and its member teams the very best and are happy to be rejoining some old friends in the WFA,” said New York Sharks owner, Andra Douglas. We will post our updated 2017 schedule soon so keep an eye out Shark Fans!! All Fins UP!! 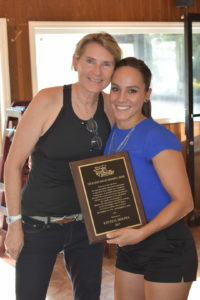 The annual awards banquet was held this past Saturday, October 8th, at Nick’s Lobster House in Brooklyn, New York. As per usual, all were overdue for a team reunion so a good time was had by all! 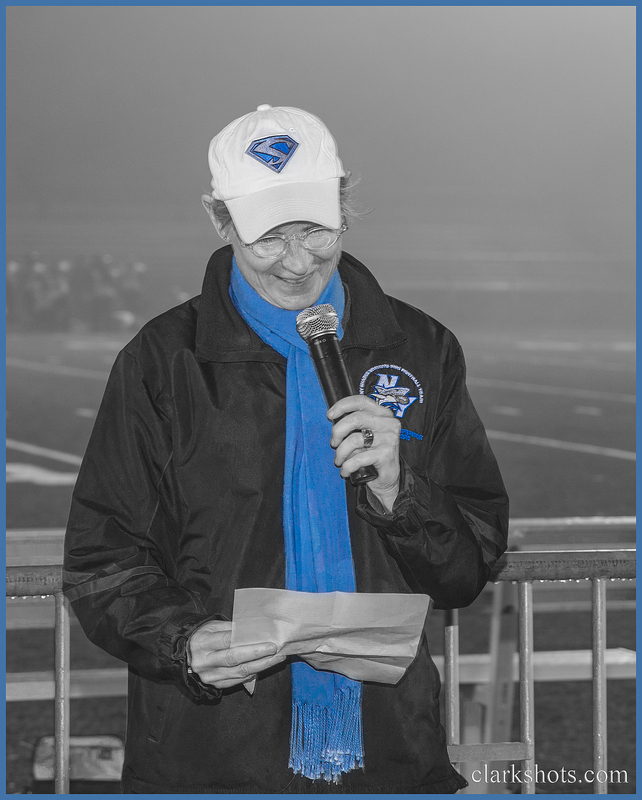 In traditional Shark fashion, the event was MC’d by Owner, Andra Douglas, accompanied by retiring Head Coach, Richard Harrigan. Congratulations to each of the deserved 2016 award recipients who, along with their teammates, and our coaching, administrative, medical and volunteer staffs, played a vital role in not only a successful season on the field, but off the field as well. Well done Finned Ones!! Your New York Sharks – each and every one of us – are indebted to you: our family, friends, significant others, and fans. Your unconditional love, boundless support, and unwavering encouragement of us living our dream means everything to us. Our team is our second family in a way that simply can’t be put into words. Regardless of the final score on the field, this Shark Family is special, strong, solid, and proud – something that will always transcend what is written in any record book. 8-0 FOR 1ST TIME SINCE 2006!! 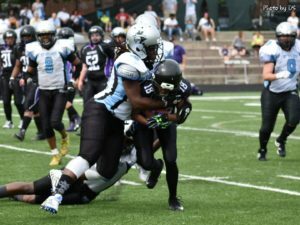 Your New York Sharks played a steady, strong game against the Washington Prodigy on Saturday, June 11th at Aviator Sports and Event Center. The win puts the Sharks at the top of the Atlantic Conference with the first undefeated, regular season in 10 years. 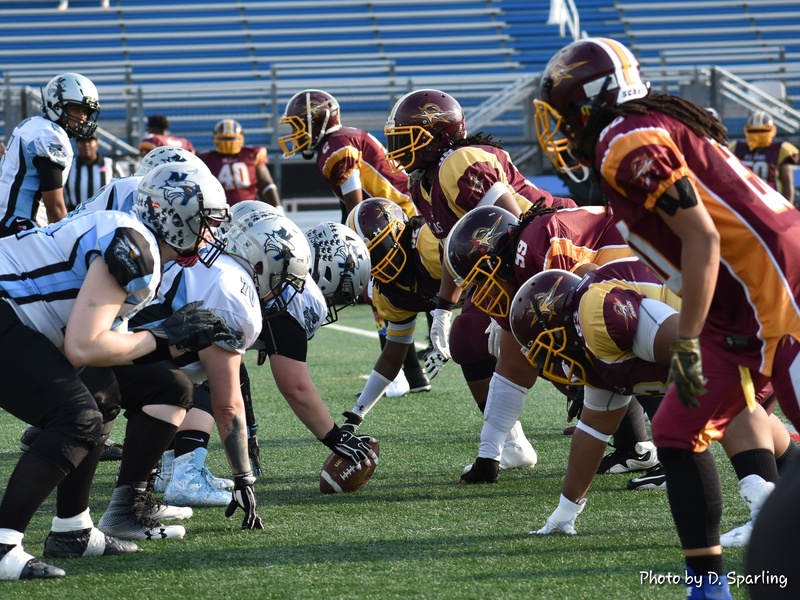 The team has earned a first round playoff bye and will travel to play an historically significant rematch against the Minnesota Vixen on July 9th for a second round playoff game. 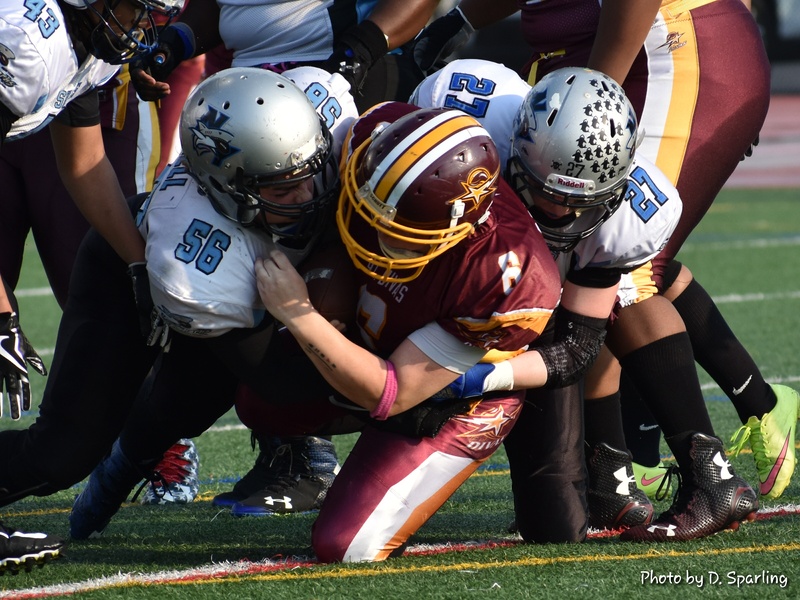 This will be the first time our two teams – the longest operating teams in women’s tackle football – have met since December 11, 1999. 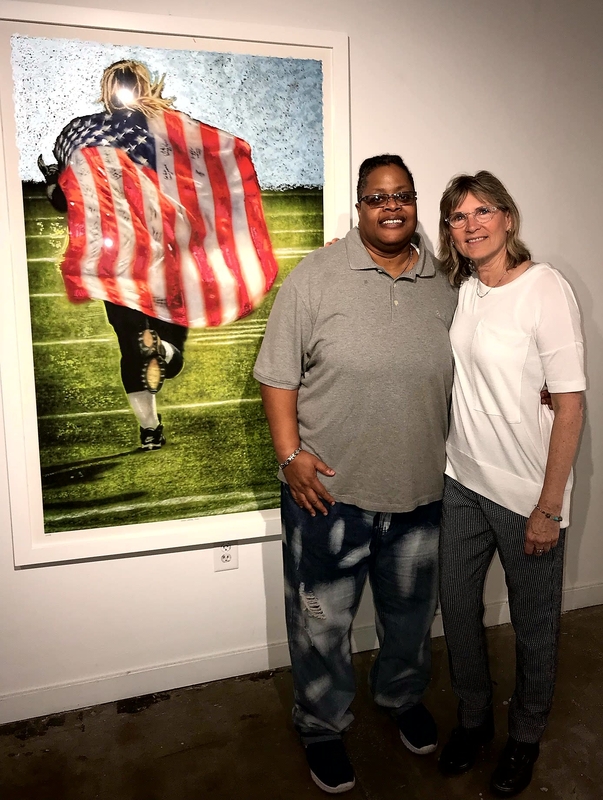 We would like to give special thanks to the all – female officiating crew from the NFL’s W.O.N. program for their excellent management of the game! 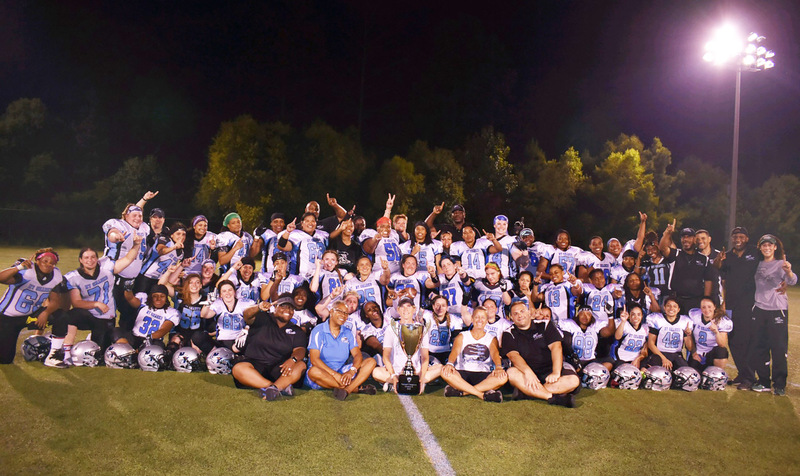 After an overnight bus ride, 90 degree heat mixed with some good ole’ southern humidity, your New York Sharks, now (7-0), earned a victory that secured them the title of Atlantic Conference Champions!!!! Final score – 42-12. Thanks to our loyal and true New York-based fans who made the trip down and to our local fans who came out to support us at the game!! You were awesome!!!! Thanks also to the Carolina Phoenix for being such gracious hosts. RESPECT! 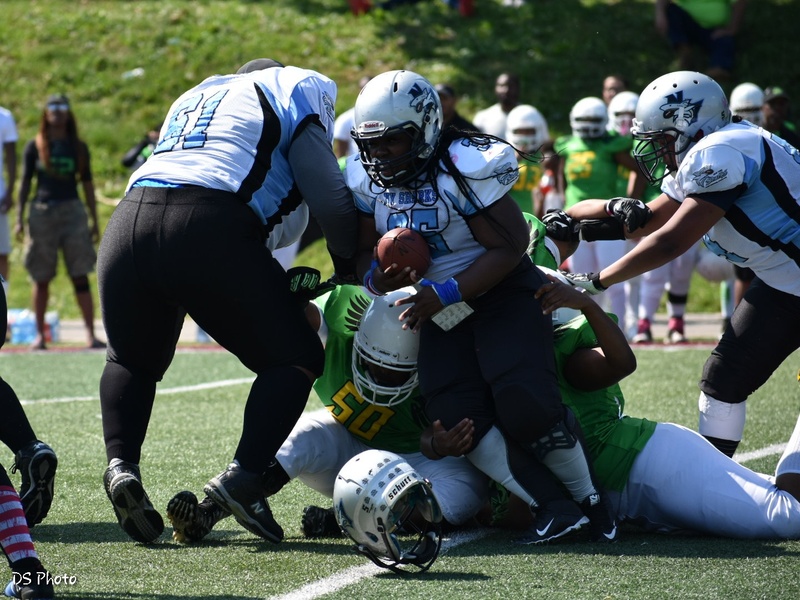 Your New York Sharks triumphed in a come-from-behind win against the Montreal Blitz with under 2 minutes left in the game. 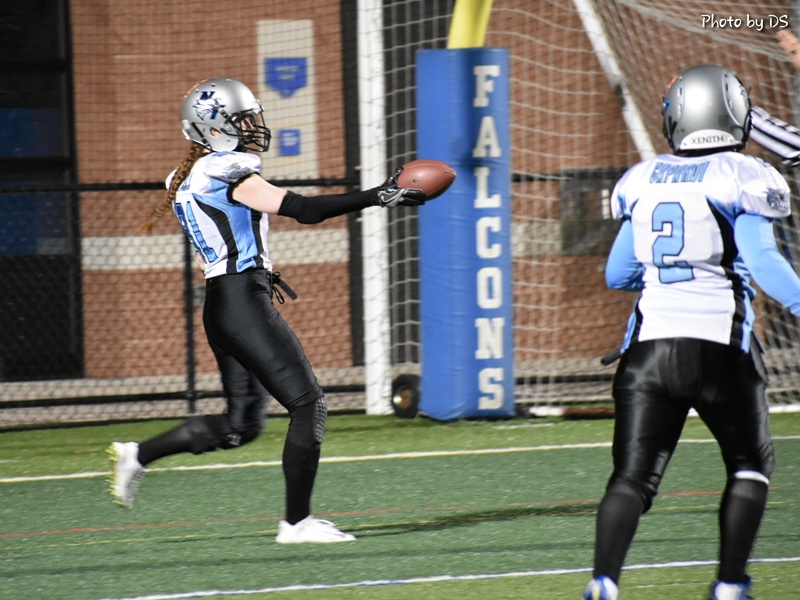 Quarterback Karen Mulligan connected with receiver Maggie Natell for a 42 yard completion at 1:58 in the 4th quarter with the Blitz leading 12-7. On the very next play, QB Karen Mulligan once again connected with Maggie Natell for a hard-fought touchdown. 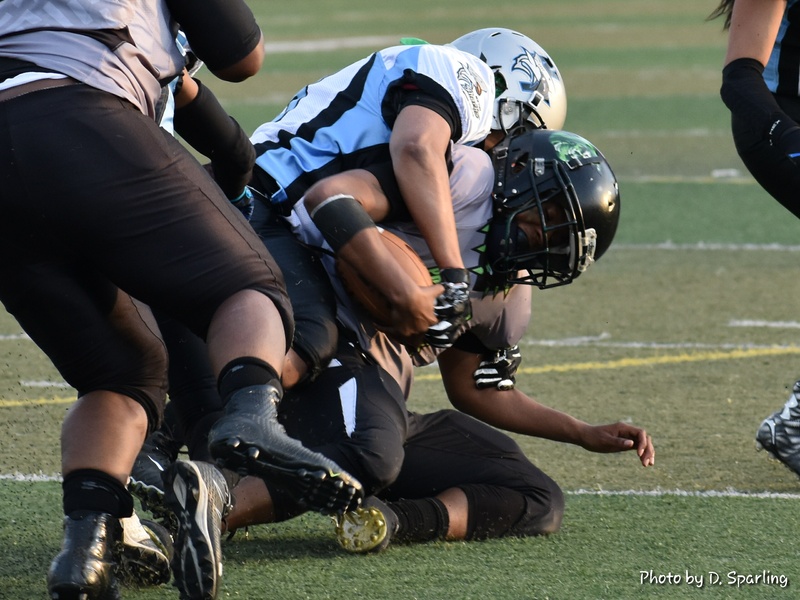 Your Sharks attempted the 2 point conversion, but fell short. 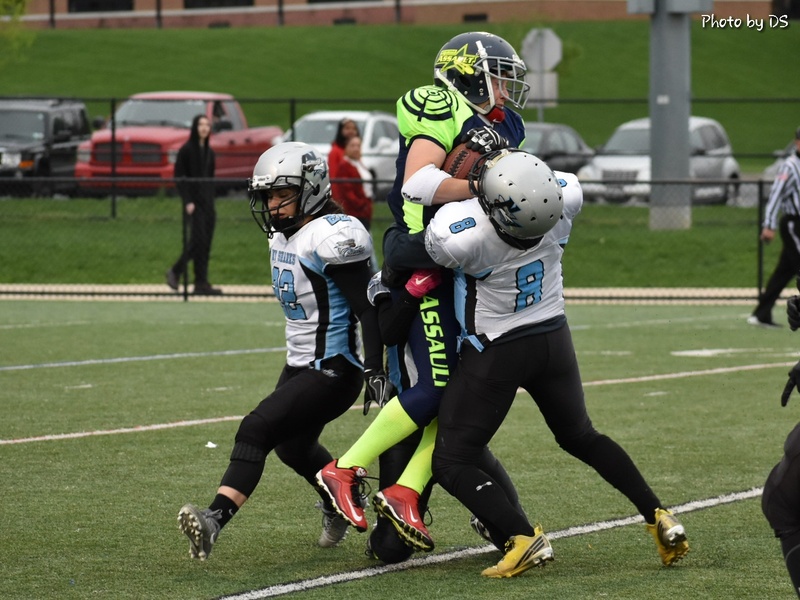 The Blitz then worked their way down field, but their attempted field goal fell short and the Finned Ones emerged victorious!!! The Sharks move to 5-0 in the Atlantic Conference. 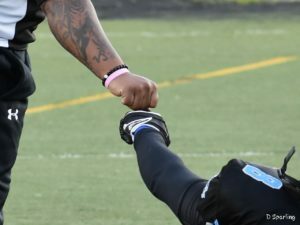 While both teams gave “all heart,” played until the end and left all they had on the field, the Sharks were victorious against the Queens in this first ever match up. We are grateful to Ebony Kimbrough and her Queens for making the long trip and playing some hard-hitting football!! IN THE END: SHARKS WIN 10-7 IN OVERTIME!! 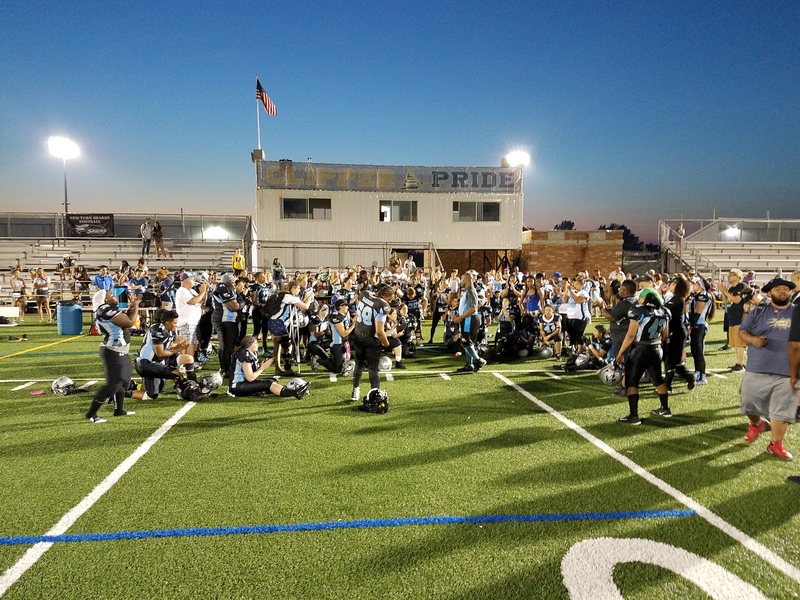 In a hard-hitting, exciting, back-and-forth battle for four full quarters plus an overtime period, your NY Sharks emerged victorious over the Washington Prodigy on a picture perfect night for football. 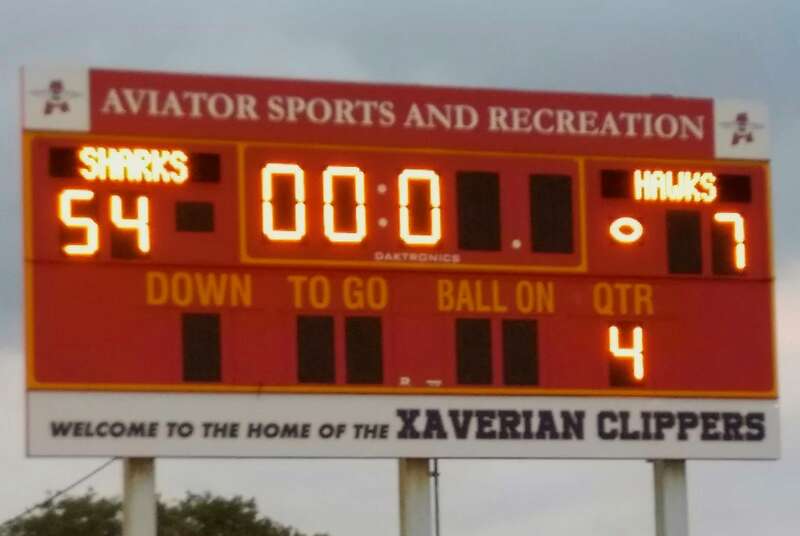 The ball game came down to a successful 21 yard field goal by Maggie Natell with 0:00 on the clock, in overtime!! This hard fought victory puts the Sharks at 3-0. Next up: this coming Saturday, 4/30/16, the Finned Ones host the Carolina Queens back home at Aviator Sports Complex, 6pm kickoff. 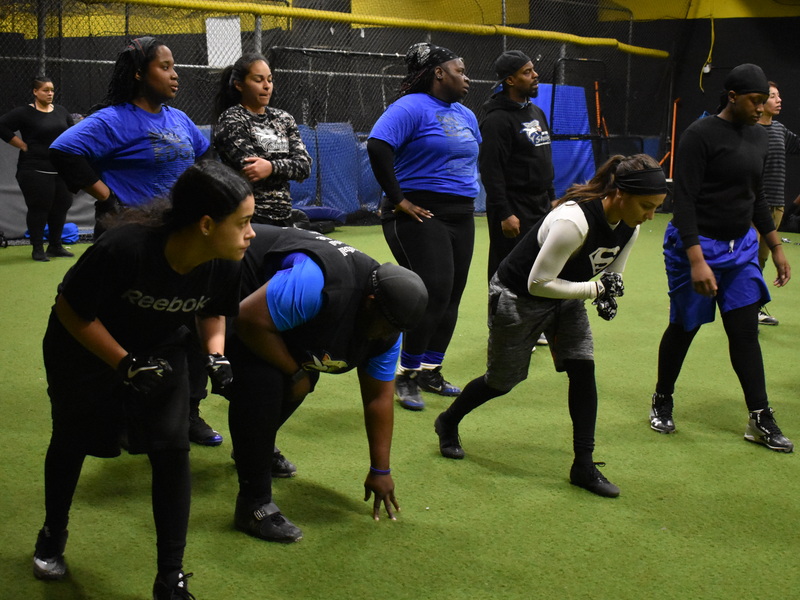 In a strong, solid showing last night, the Sharks shut out the Philadelphia Firebirds 32-0 at Aviator Sports Complex in Brooklyn, New York. 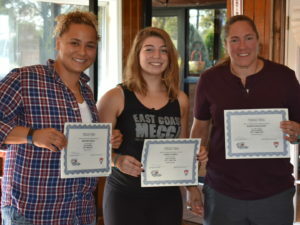 Gabriella Farrell was a defensive standout along with Brilynn Fields and Krystal Molina on offense. 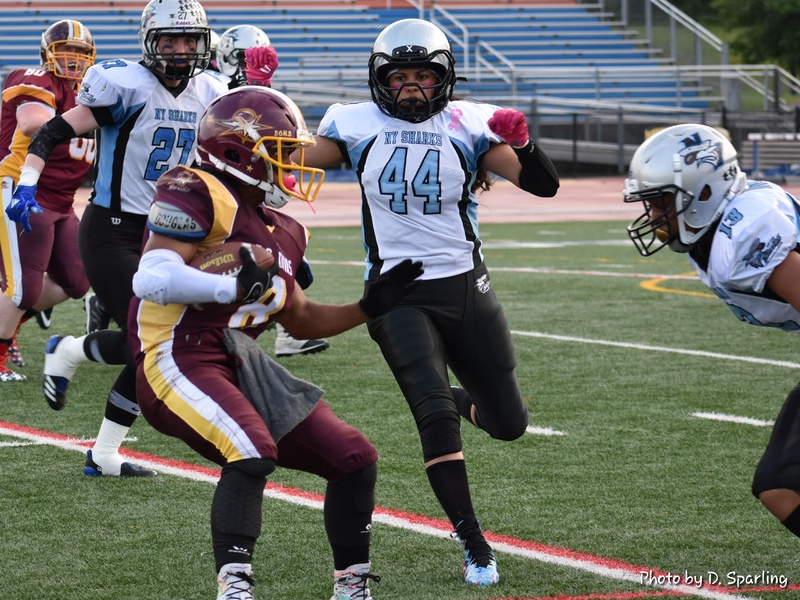 Your New York Sharks played to the very end on Saturday and wound up victorious in a challenging contest with the Montreal Blitz at Mitchel Field in Garden City, New York. The Sharks had many stars in the house for the first game of the 2015 season! Local singing group, Exit 21, performed the National Anthem. Former Jet players, Bobby Jackson and Wesley Walker joined the captains on the field for the coin toss. Finally, the 2016 Hall of Fame Inductees came “home” to be honored for their on field accomplishments during their years in uniform. We were thrilled to see them and the ceremony was very special for all of us. 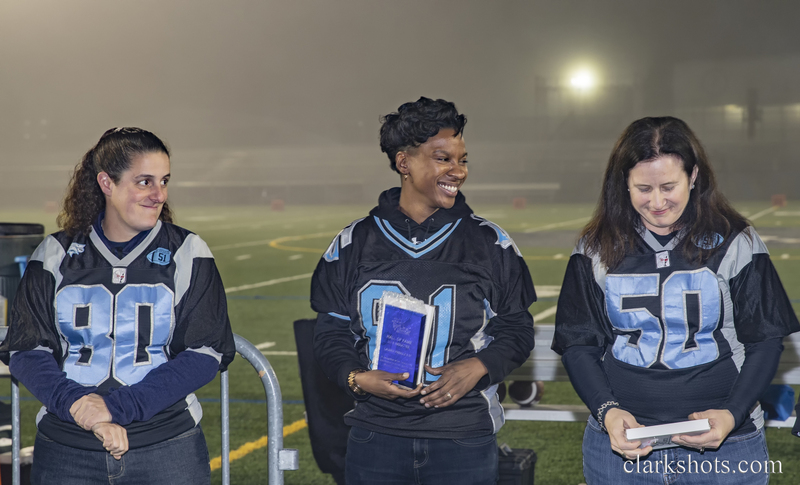 Congratulations to Jennifer Blum, Lori DeVivio, Virginia “Chachi” Leon, Wanda Williams and Donna Spilotras for their induction into the New York Sharks Hall of Fame!! Staff and players recently participated in this special event as part of our new partnership with the Make-a-Wish Foundation. The players and staff who attended were very moved and honored to be able to bring some good Shark joy to the young patients at the hospital. 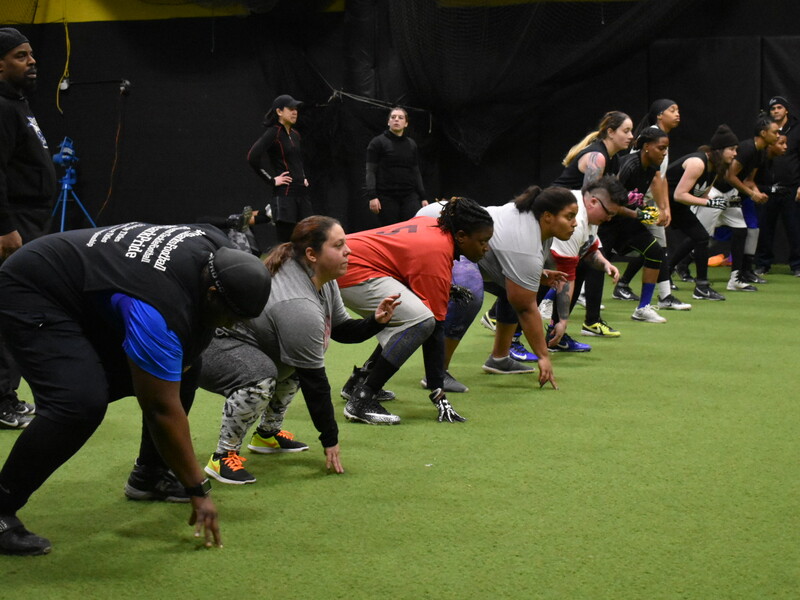 The players, coaches and staff are fired UP for the start of training camp this Saturday, January 9th!!! We have our “eyes set on the prize” and we want to thank you now – our families, friends, and fans – for supporting us in all the ways that you will in the coming months. 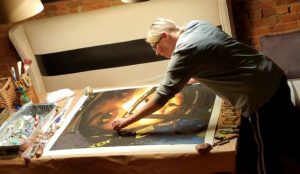 …and make the Home Page of the the Make-A-Wish Foundation – see link below! 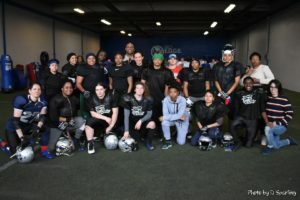 The New York Sharks recently completed the required training to become “Wish Grantors” for the Make-A-Wish Foundation. 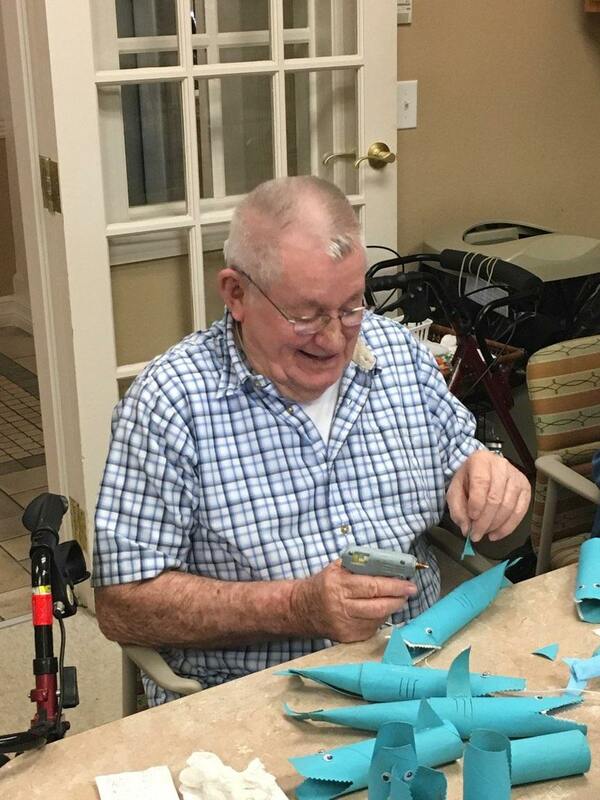 We are excited and humbled to have the opportunity to bring some smiles and joy into the lives of children battling life-threatening illnesses. 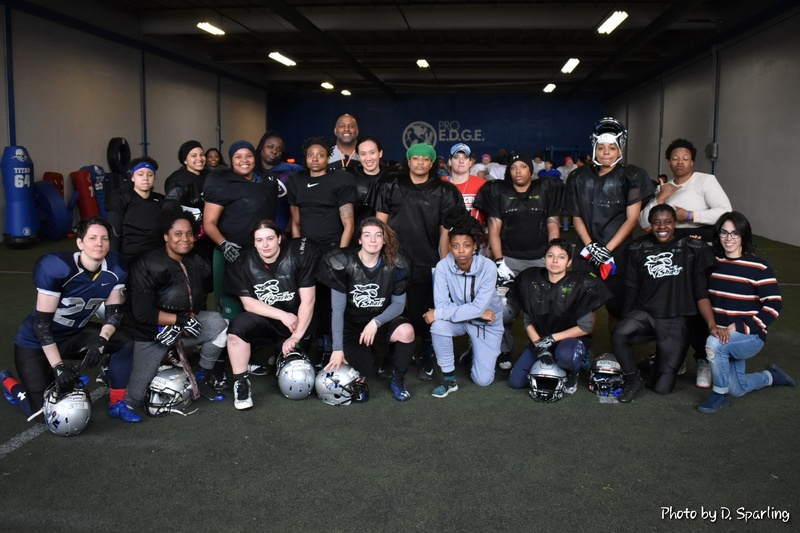 The “sister” non-profit foundation of the New York Sharks has officially changed its name to the Women’s Gridiron Foundation. 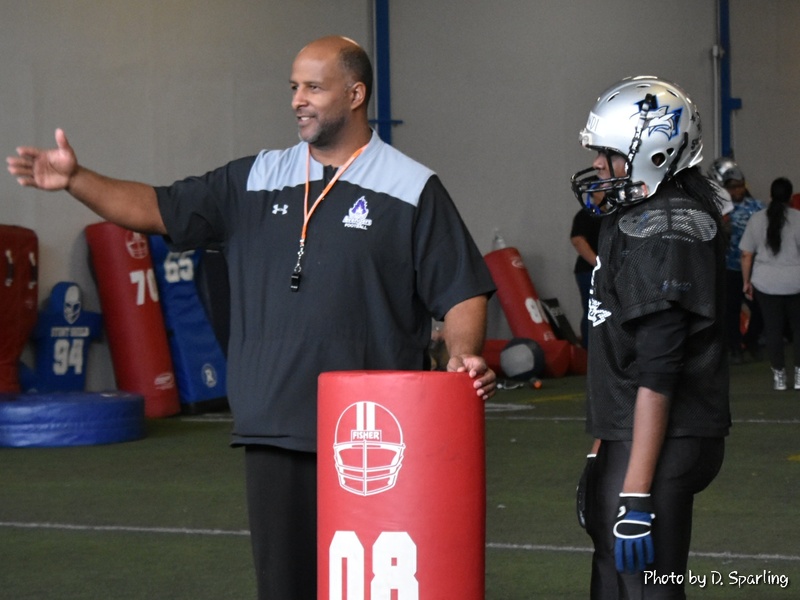 We will be expanding our girls football camps into other cities across the country – and the world – as well as adding new and innovative community based programs. 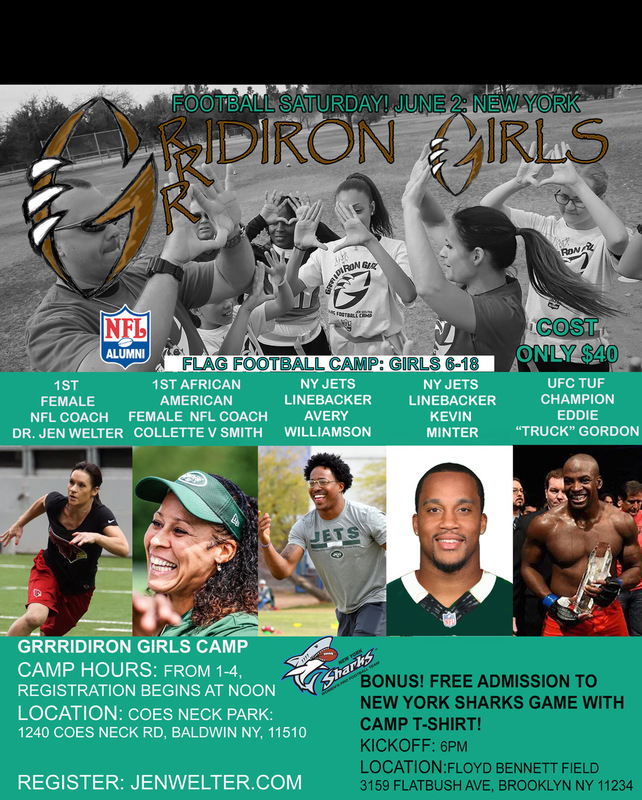 Our camps will now be known as the Fins Up Sports Camps for Girls. Please visit our new website and support our mission!! Thank you!! The WGF engages young girls and women in highly innovative, gender equitable programs through the vehicle of sport – primarily football. We educate and empower young women around the world to a place of greater self-worth and healthy self-esteem. 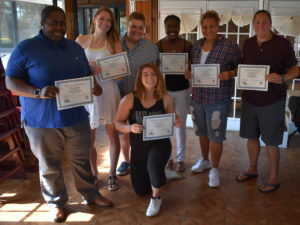 The Sharks held their annual Banquet yesterday in Brooklyn, New York, where the player awards for this past season were announced. Congratulations to all of our deserved Finned Ones!! 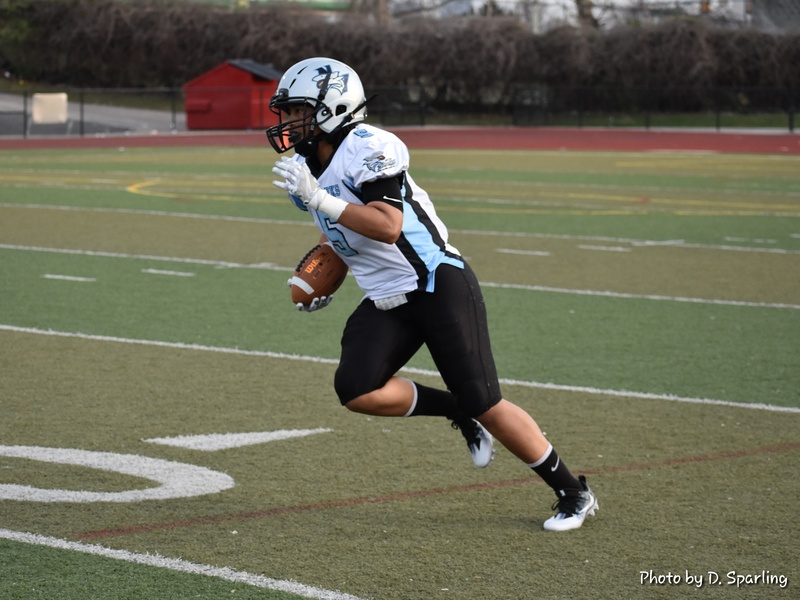 Congratulations to the ten NY Sharks players voted onto to the Eastern Conference All Star Team by their sister IWFL teams!!! 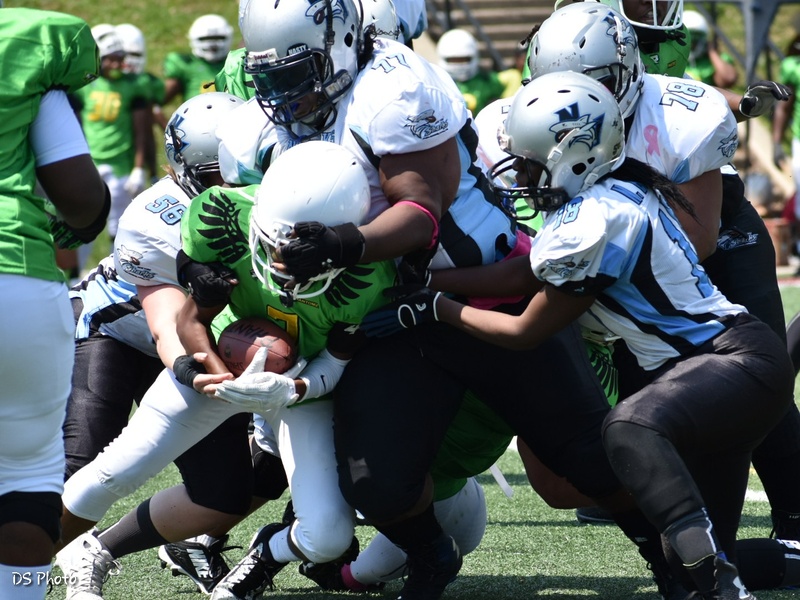 After overcoming a 21 point deficit at one point in the 1st half, your NY Sharks dominated the 3rd quarter making it was anyone’s playoff game win from that point forward on Saturday 6/27/15 at Cupples Stadium in Pittsburgh. 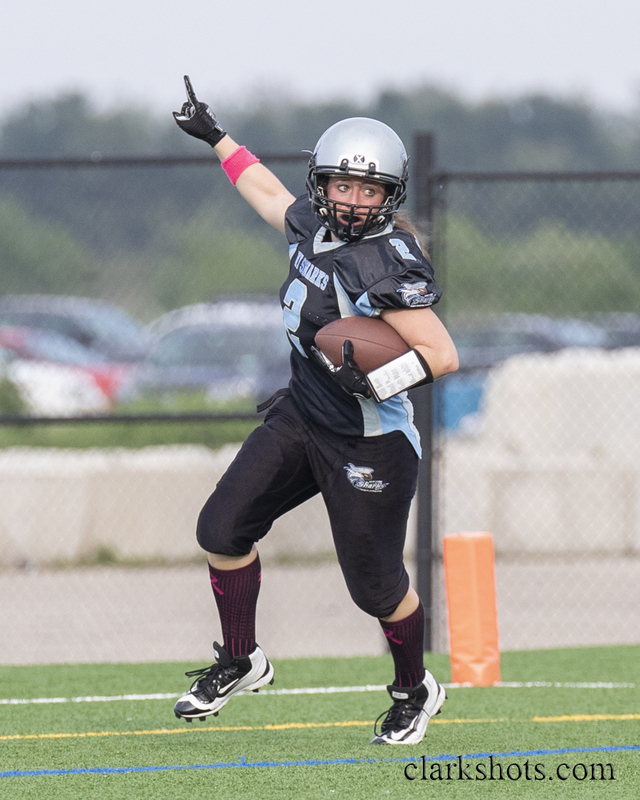 With just minutes left in the game, from their own 27 yard line, Sharks QB Karen Mulligan threw a perfectly timed 22 yard pass to Receiver Erika Cottle who then sprinted 52 yards to the end zone. Maggie Natell kicked a textbook extra point, making the score 28-28. 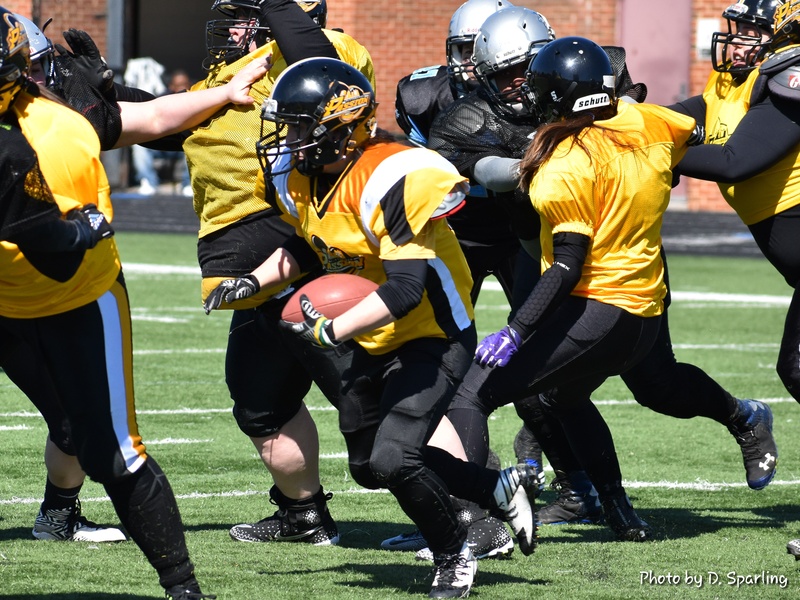 Then, after starting Pittsburgh QB Lisa Horton went down and back up Angela Baker filled in at QB, a handoff to rookie running back, Tara Catone, led to another 6 points for the Passion. This would be the final score of the game – Sharks 28, Pittsburgh 35. Fans, players and coaches from both teams could be heard describing what they had just witnessed as a game worthy of being called as a championship match up. 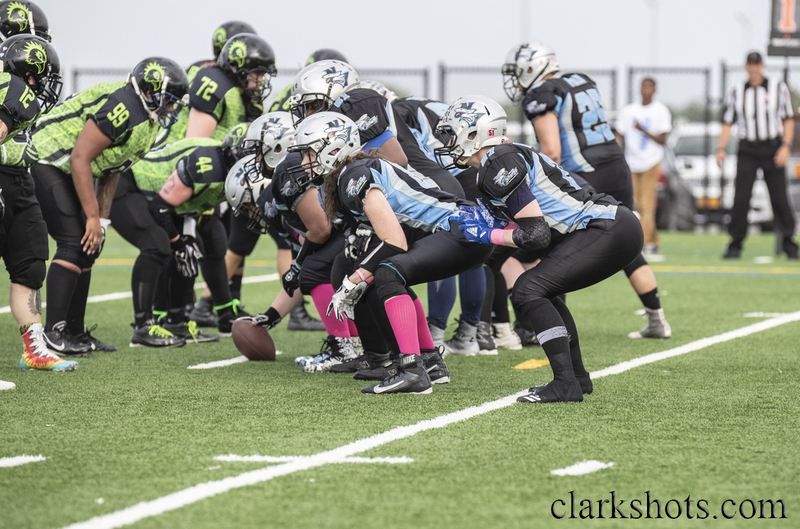 Although Shark hearts and fins will remain heavy for awhile, the players represented the organization with toughness, strength, class and amazing sportsmanship. 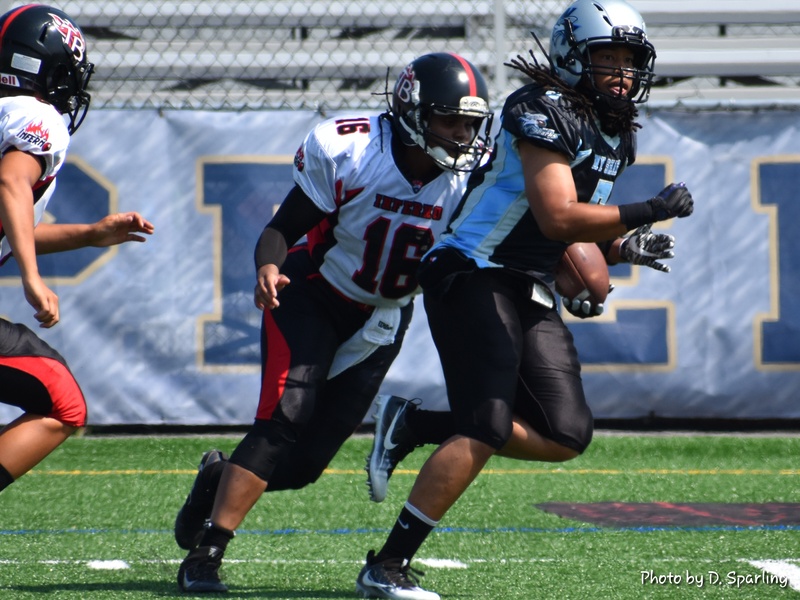 The Sharks of The Black and Blue edged out the Philadelphia Firebirds in an exciting game on Saturday. This victory marked the end of the regular season and your Sharks as North Atlantic Division Champions with a 6-2 record!! 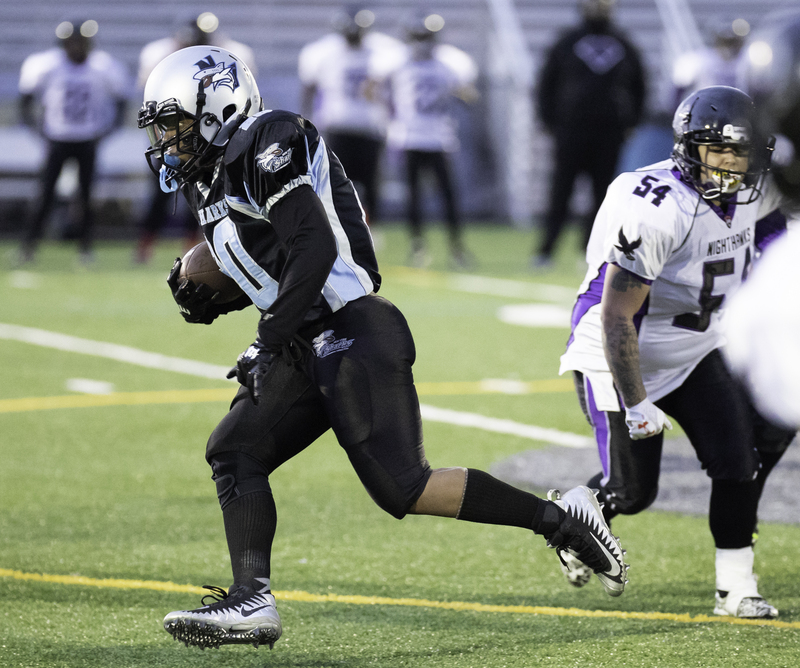 The Sharks will be headed to Pittsburgh for the 1st round of playoffs on June 27th, 7pm kickoff at the Passion’s home field, Cupples Stadium. A victory will bring a 2nd round playoff game their way on July 11, 2015 – location TBD. Shark Fans – how about a Road Trip to Pittsburgh?!?! Your New York Sharks stayed the course and pulled out the “W” in a 24 hour trip to Canada yesterday. In an intense, very physical match-up, the Finned Ones fought until the end. With under 2 minutes left in the game, a key interception by #40 Kryrystal Molina secured the win. 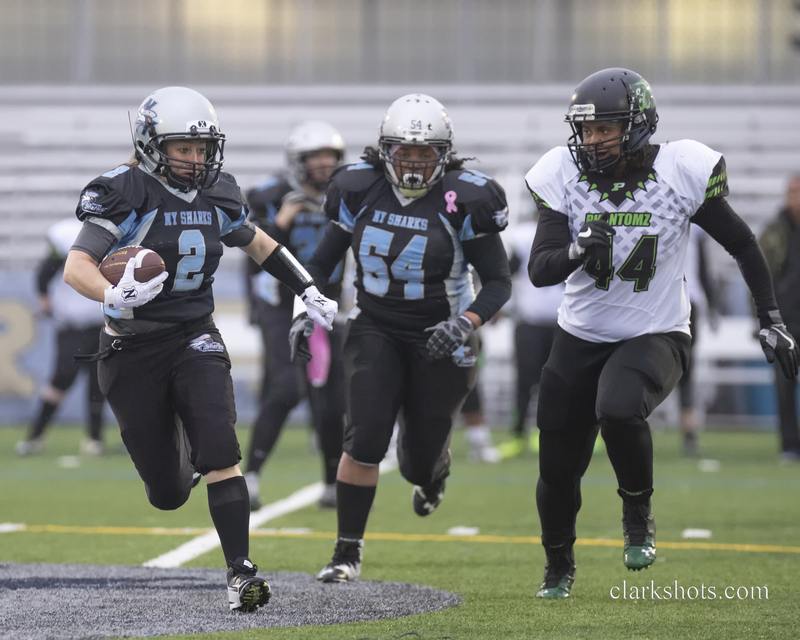 Rookie running back #23 Shanon Morris simply tore up the turf in the running game while wide receiver #81 Maggie Natell caught both touchdown passes from veteran quarterback #30 Karen Mulligan. The Sharks defense stopped several drives by the Blitz in a solid, unified performance. Although now tied (in record) with Montreal in the North Atlantic Division, the Sharks are in the #1 spot with a now 2-0 record against Montreal in head-to-head competition. This places the Sharks in the best position possible with the last regular season game approaching and playoffs just ahead. On Saturday, May 23rd, 2015, the NY Sharks came out with a clear victory in Danbury, Connecticut against division opponent, the Connecticut Wreckers. The victory brings their record to 4-1. 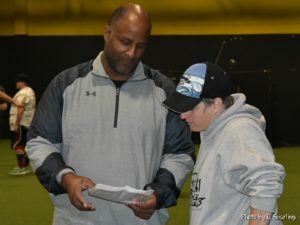 BK Live, with Michael Bellamy, presented a feature story on, and an in-studio interview with, the NY Sharks on May 13, 2015. Head Coach Rich Harrigan and sisters, Brilynn and Brooklyn Fields were interviewed by Bellamy. 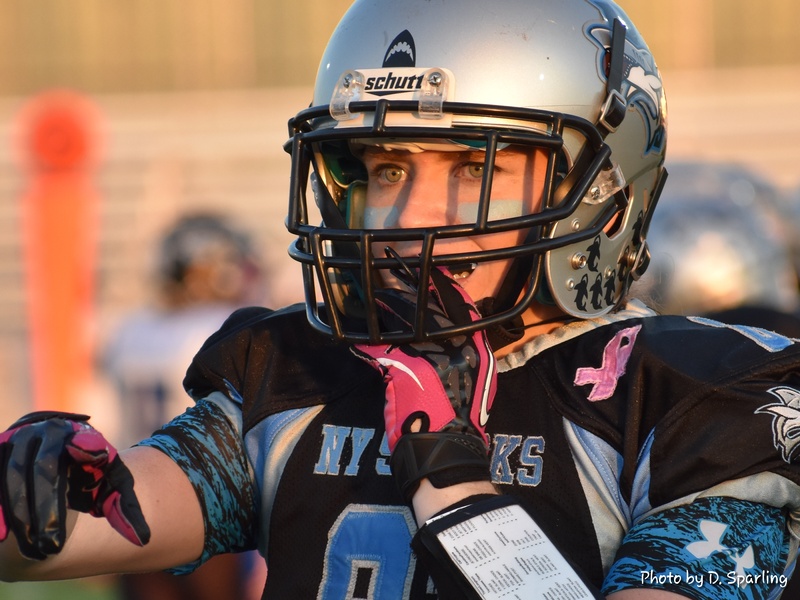 Brilynn is a second year wide receiver and her sister, Brooklyn, is a standout rookie linebacker on this year’s roster. Click on the link below to see the story and interview. The New York Sharks gave it their all, but came up short in Pittsburgh on Saturday. 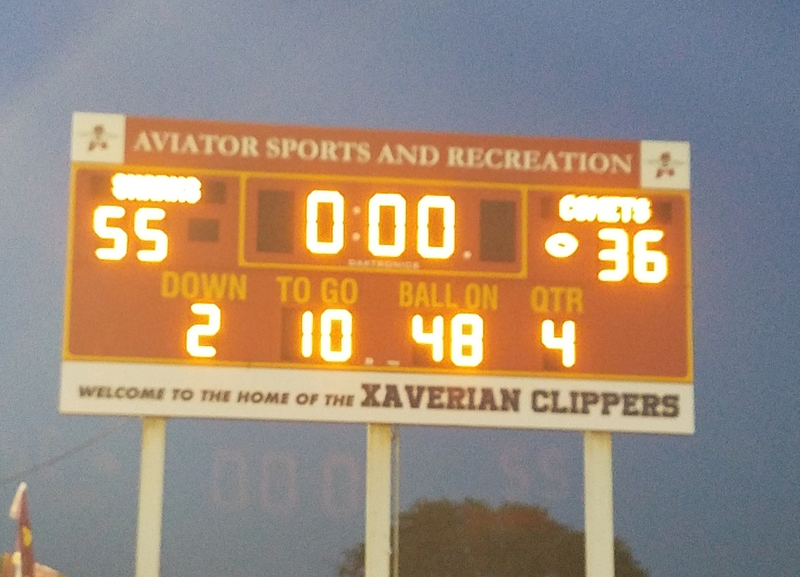 The final score was 32-18. 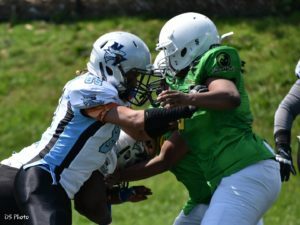 The Sharks have a bye this coming weekend, then play in Connecticut on May 23rd with an 11am Kickoff on Memorial Weekend. 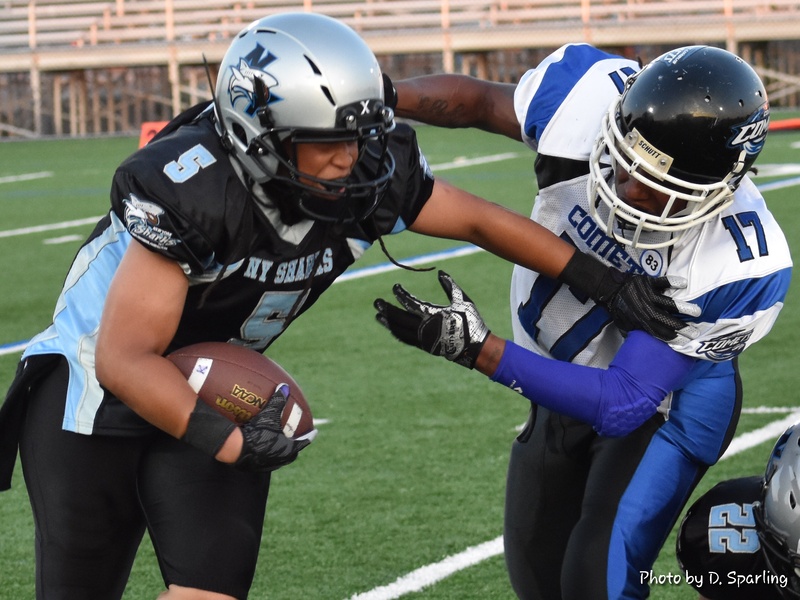 The NY Sharks were victorious for the second time this season over the Prodigy last night. The win extends the team’s undefeated 2015 season record to 3-0. 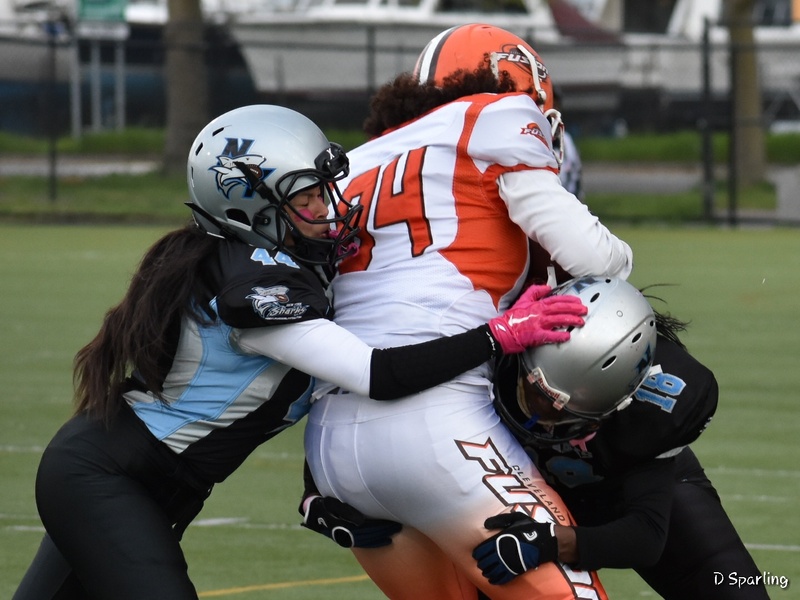 The NY Sharks squeeked by with a win in a close contest over their friends from the North, the Montreal Blitz. 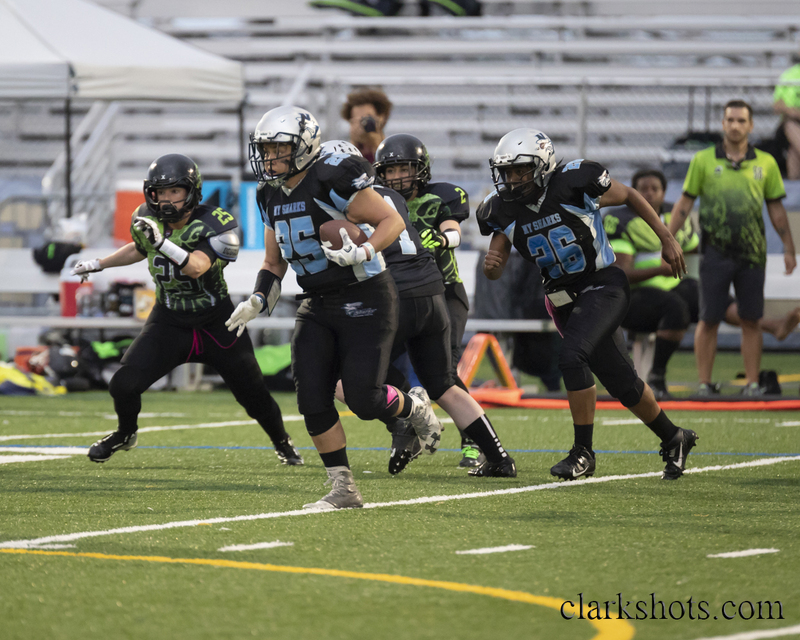 Seemingly unstoppable on this night were Erika Cottle on offense with three touchdowns and rookie, Delmara Reece, who was stellar on defense. As the clock struck zero, Sharks Head Coach, Rich Harrigan, officially became the winningest coach in NY Sharks history. Stay tuned for the Gameday write-up. “Off” the field, the evening was filled with special presentations and guests. 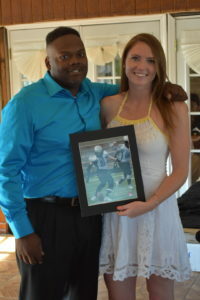 Quarterback, Karen Mulligan, was honored for her thirteen years as a New York Shark, over 100 games played in the black and blue, over 15,000 yards passing and holding the record for most touchdowns scored. Dorothy Myers brought the house down with her amazing singing of the National Anthem. USA Football’s Director of Football Operations, Samantha Rapoport, performed the coin toss. Last and certainly not least, the Sharks held their first induction ceremony into the NY Sharks Hall of Fame. The first inductees are five of the original players who first dawned a Sharks uniform back in 1999 and always “left it on the field.” These trailblazing women are Val Haleworth, Missy Marmarale, Anna “Tonka” Tate, Beth Nugent and Rose Addison. Congratulations, ladies!! 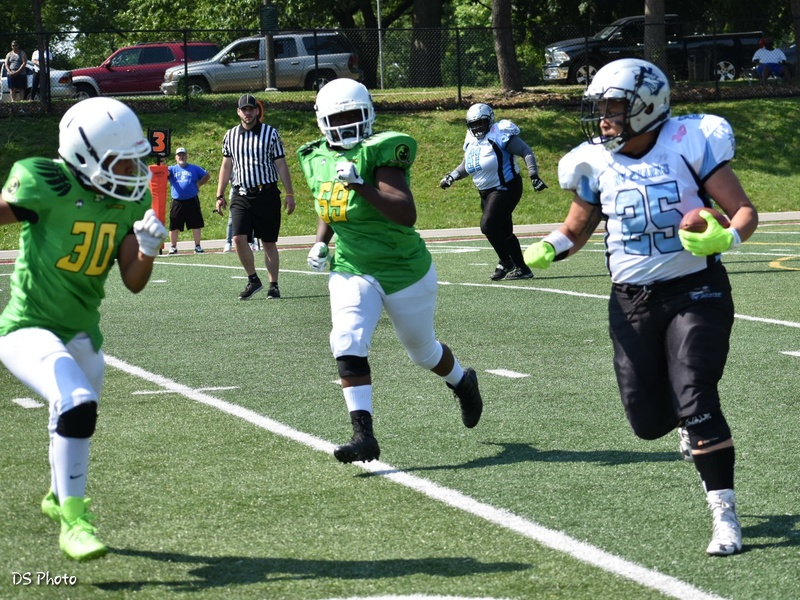 Brilynn Fields reaching the endzone for 6 ! The Sharks defeated the Washington Prodigy in their first game of the 2015 season, 37-8. Stay tuned for the detailed Gameday report. Also, we apologize for the technical difficulties we experienced that kept us from airing our usual Radio Broadcast. We will have this resolved before the next game. 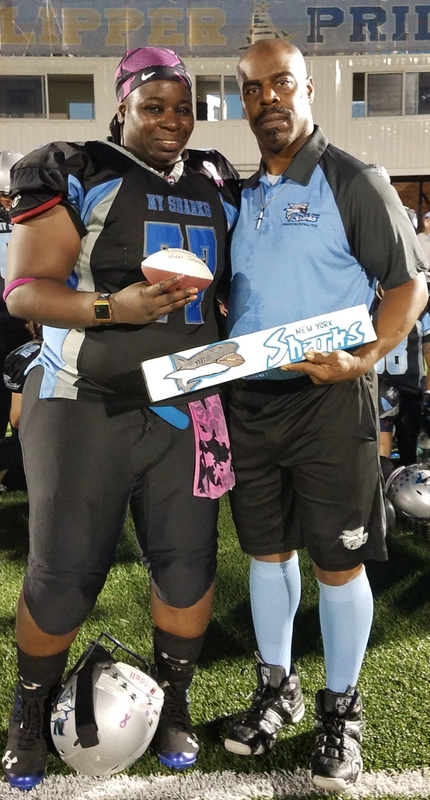 Thank you for your continued support of the New York Sharks!!! Video highlights for each Sharks game is available on our YouTube page. Hey Sharks fans! Be alerted to the latest Sharks news by following us onTwitter and Facebook. Get football games scores, standings updates, appearances, special videos, and more. Your New York Sharks have made it into post season play! 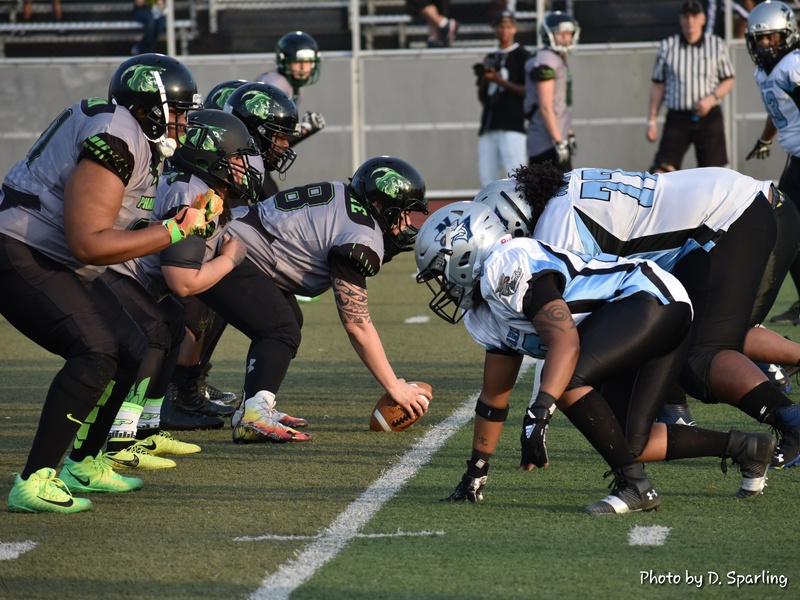 First up: Pittsburgh Passion in Pittsburgh on 6/27/15, 7pm kickoff at Cupples Stadium. 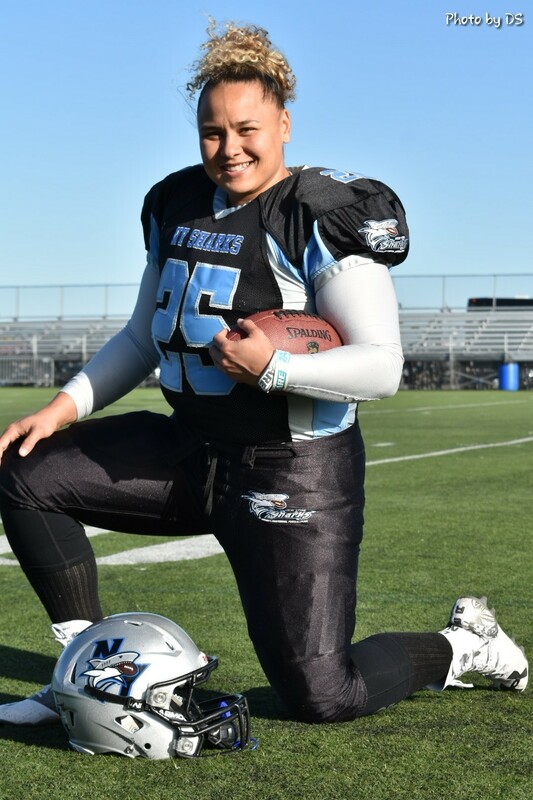 See the complete listing of every woman that put on a New York Sharks uniform since the beginning on our All-Time Roster page.